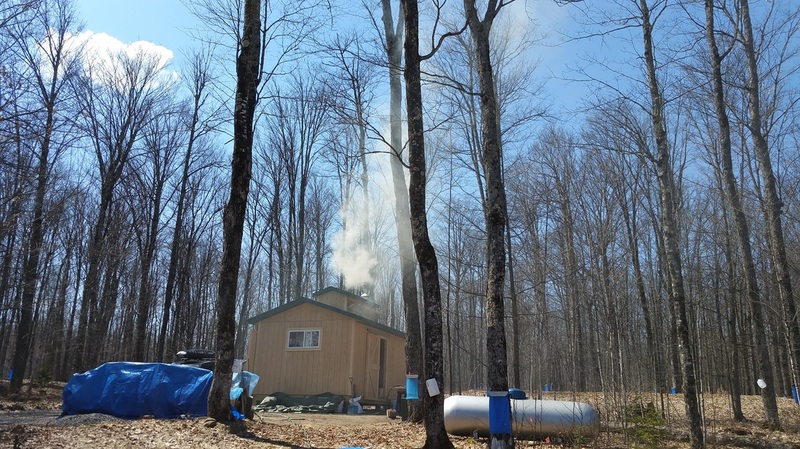 We finished our first maple syrup season at County Line Lake on April 20, 2016. 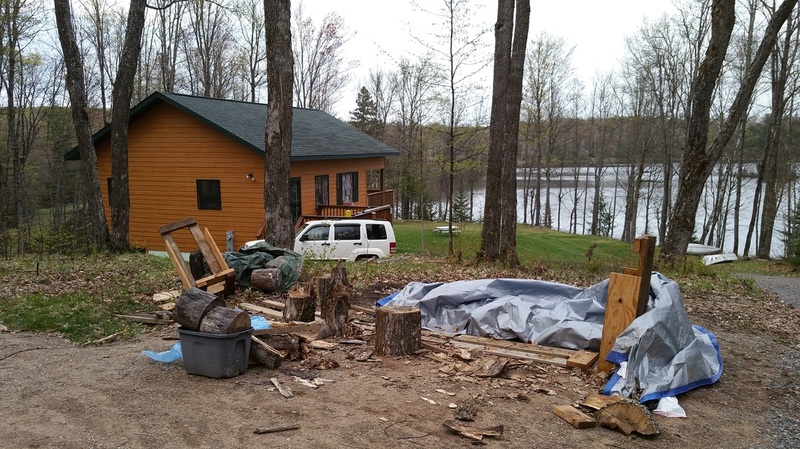 We includes my daughter Julie, grandson Oliver, wife Judy, the child of my friend Joe Golas, Matt and his two sons,Theo and Graham, neighbor David, his wife and son Patrick, along with my friend Bill Brauer and two high school friend Gary Severson and Ellie. 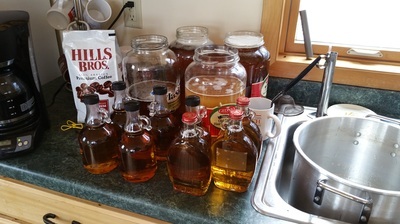 We all had a taste of fresh maple syrup and the work entailed in making the maple syrup. 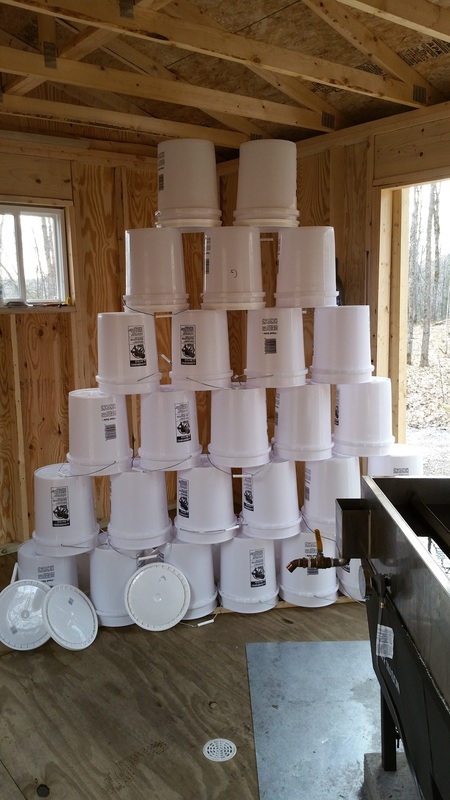 We collected well over 900 gallons of sap from 83 taps and transformed the sap into approximately 13 gallons of maple syrup. 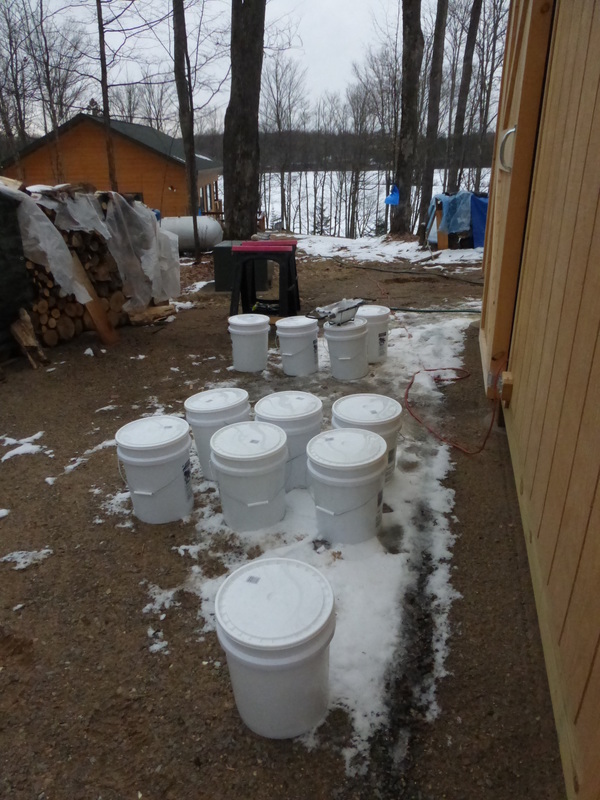 We boiled eight times and ended the season by dumping about 65 gallons of sap. 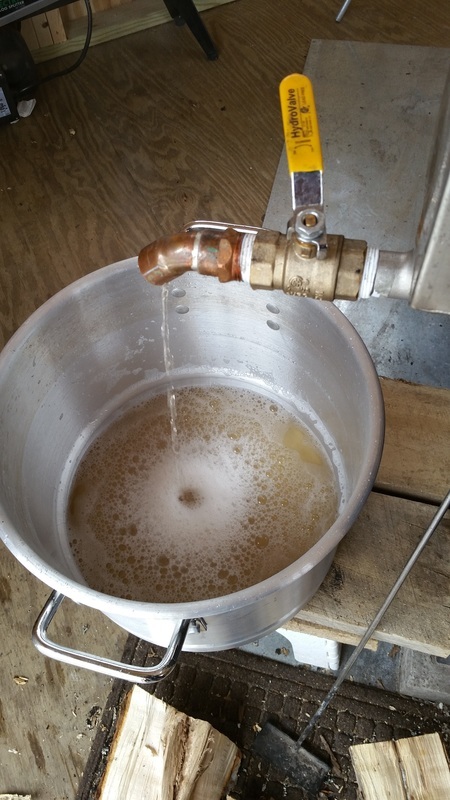 When we pulled the taps, the sap was still running but slow, so we could have had one more boil, but the weather was warming and the sap was starting to brown. 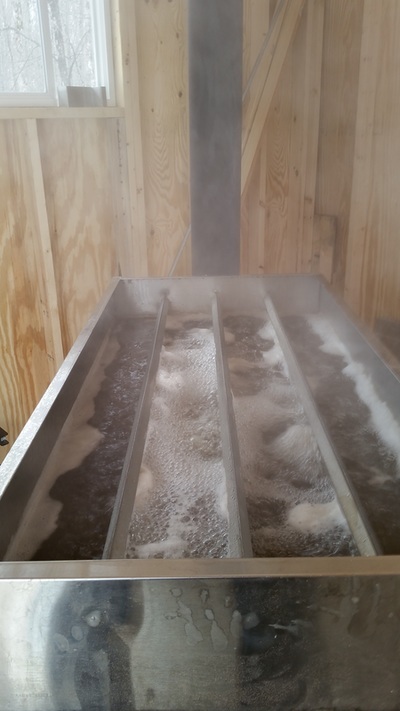 We did miss the first sap run of the season which was excellent due to the late delivery of the evaporator, but next season we are prepared to capture the sap during its first run. 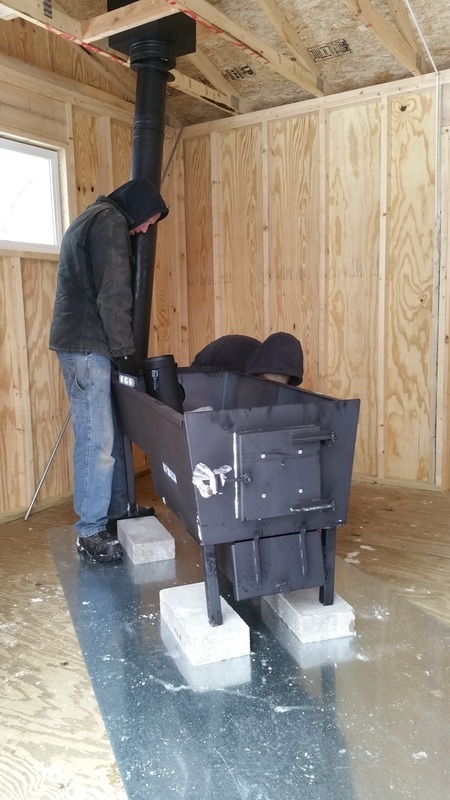 Receiving the Evaporator - I ordered the evaporator from Mason Custom Welding, 90 Chapel Street, Porter, Maine. The evaporator was delivered late as Bill Mason forgot my original order via e-mail in early December. 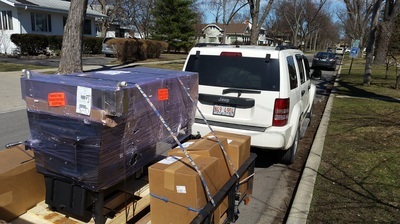 When he finished making my evaporator, he then missed a Friday delivery date which meant that evaporator was not shipped until the following Monday, and it took a week to arrive. 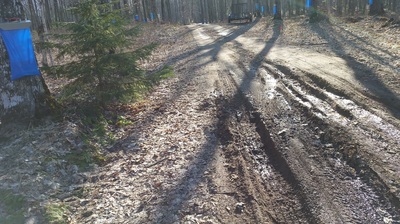 Consequently, I missed the first good weekend of the sap run. 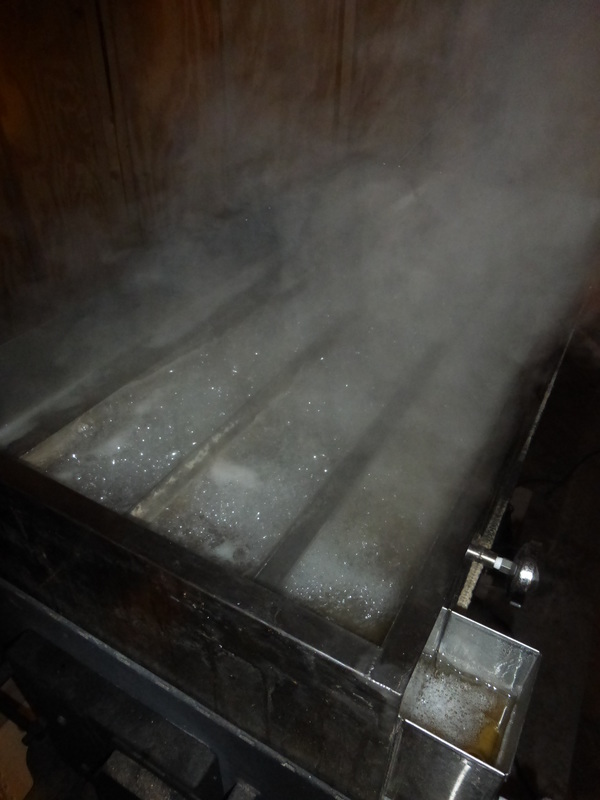 Fortunately there was over a week until the next sap run which gave me time to get the evaporator set-up and ready to boil the sap. Even though he misplaced my original order and missed a delivery date, I am very pleased with his advice and quality of workmanship. 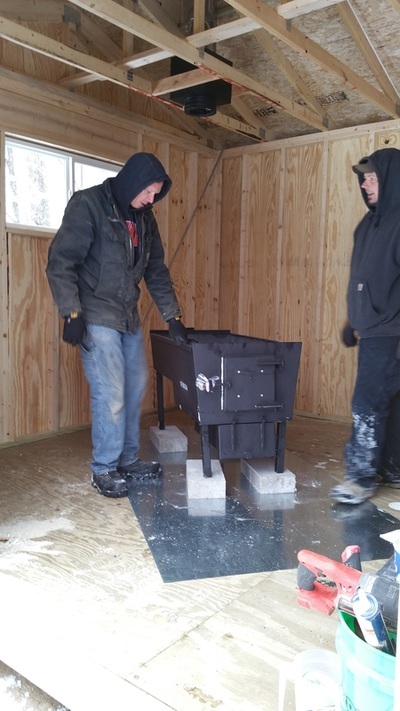 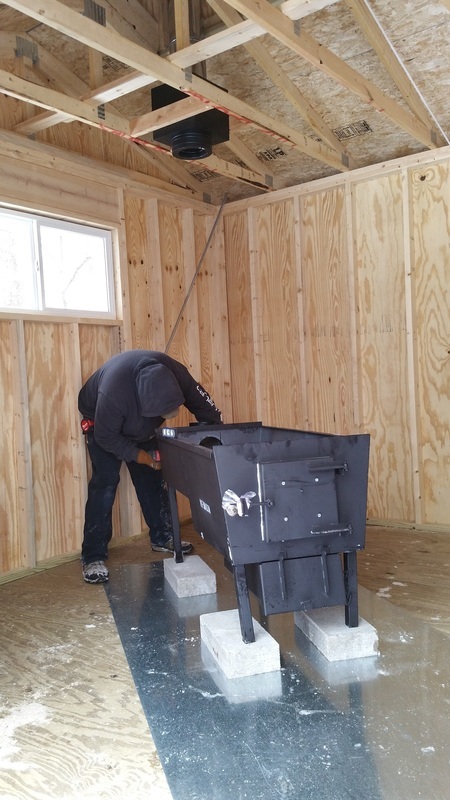 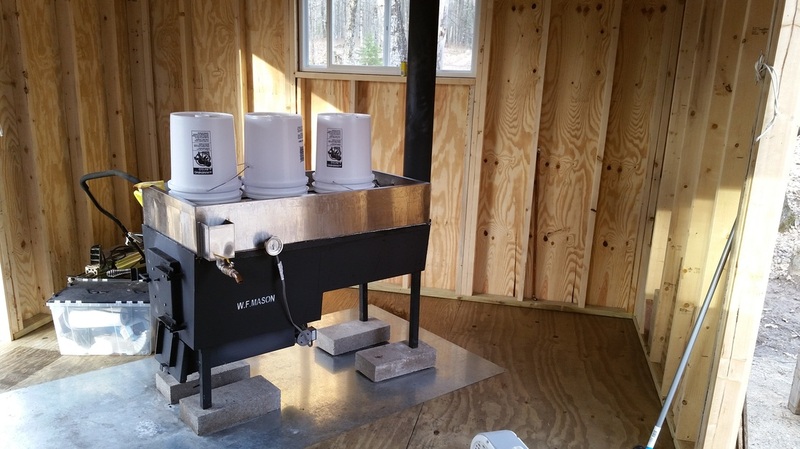 Installing the Evaporator – Van Caster Builders of Conover, Wisconsin built my Sugar Shack the previous fall, and I had them install the evaporator due to their excellent workmanship. Installing the evaporator included installing the smoke stack. 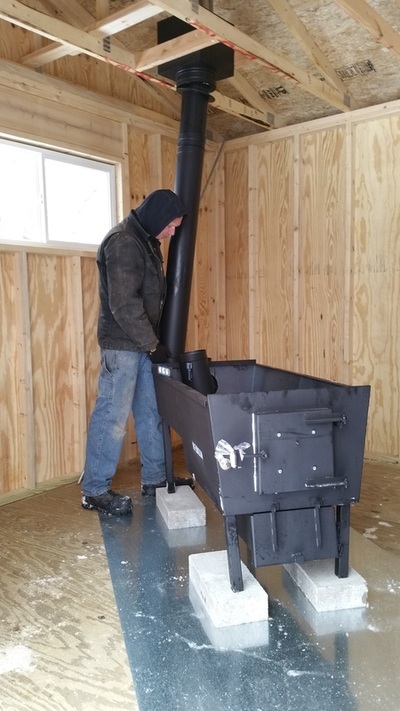 It took Jeff Van Caster, the owner, a few days for them to acquire all the necessary parts to install the smoke stack. 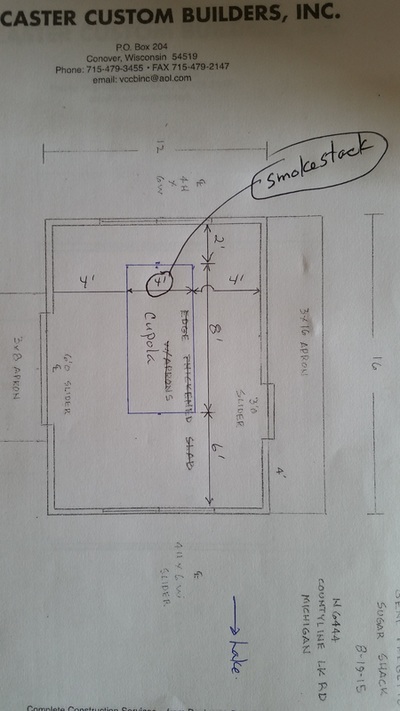 In addition, I wanted a large piece of sheet steel to be on the wooden floor under the evaporator. 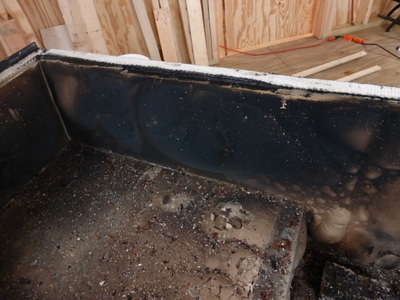 The sheet steel was recommended by Bill Mason to protect the wood floor. Mortaring the Evaporator – The evaporator required the installation of firebrick along the walls and bottom of the arch. 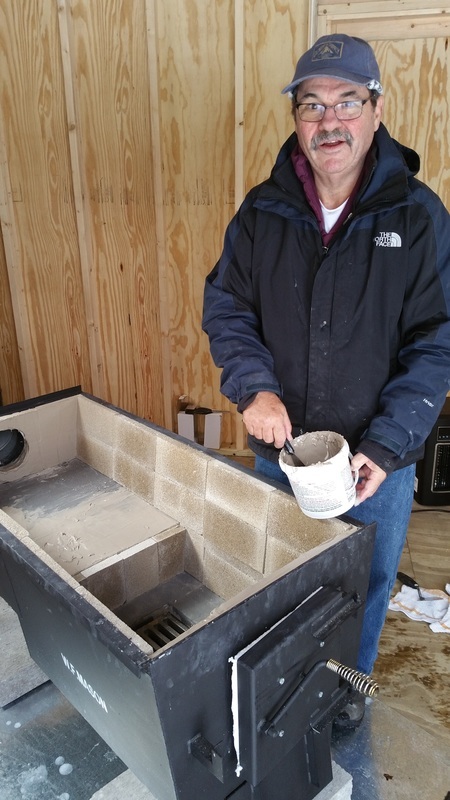 I read Bill Mason’s website to find instructions as to how to install the fire brick. 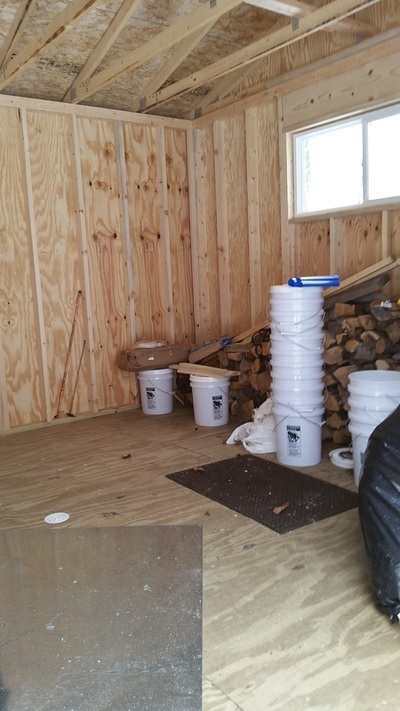 It was unclear as to the number of firebricks required to complete the installation as there is some conflict between Bill Mason’s general recommendation and the installation instruction written by another person, Cindy Boles. 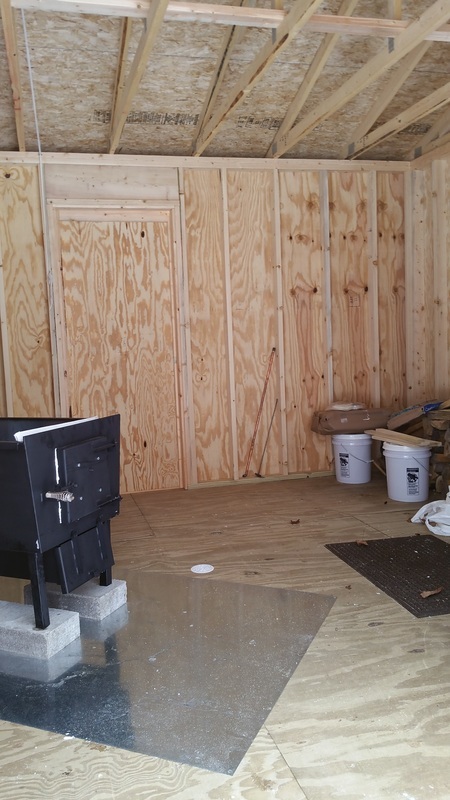 Firebrick is not commonly available in retail stores such as Home Depot and Menards. 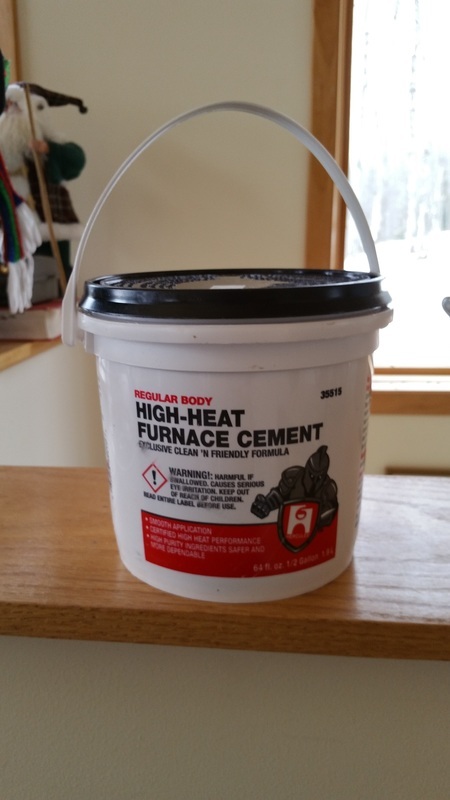 Consequently, I had to order the firebrick online. 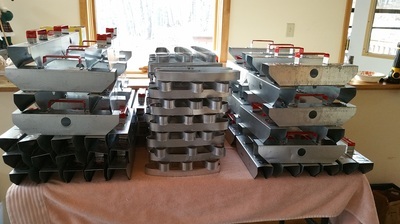 Since firebrick is not commonly available in retail stores, and I would be over 50 miles to the nearest Home Depot or Menards, I order the maximum estimated quantity of firebrick which came to 85 firebricks. 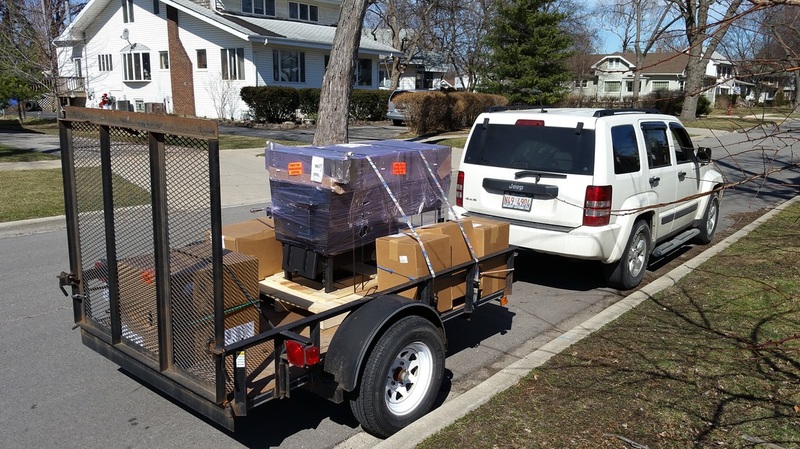 When I got all the boxes of firebrick, I definitely felt that I ordered too many firebricks. 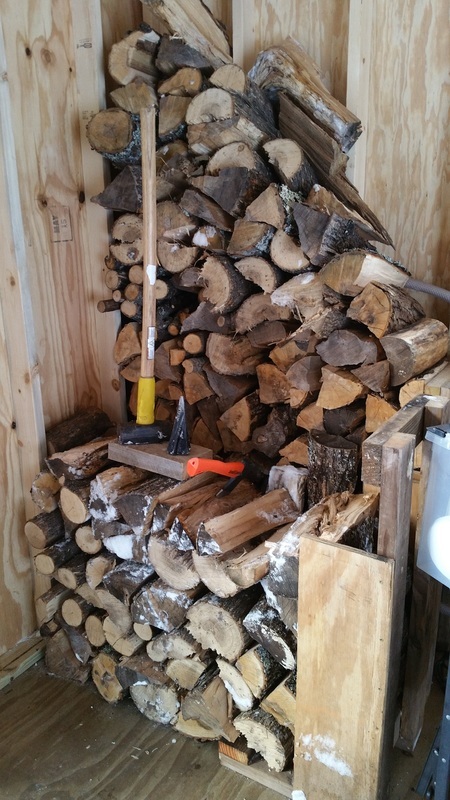 Surprisingly, I used nearly all the firebricks with only a few extra bricks to spare. Bill Brauer spent the first week of maple syrup season up north. It worked out great even though the sap was not running while he was up north. 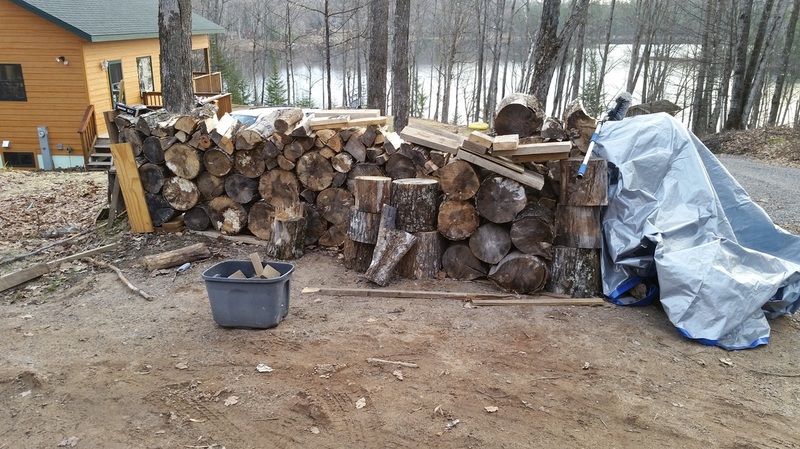 However, he helped me tap the trees, install the firebrick which took two days or a total of approximately 20 man-hours to cut and mortar the firebrick. 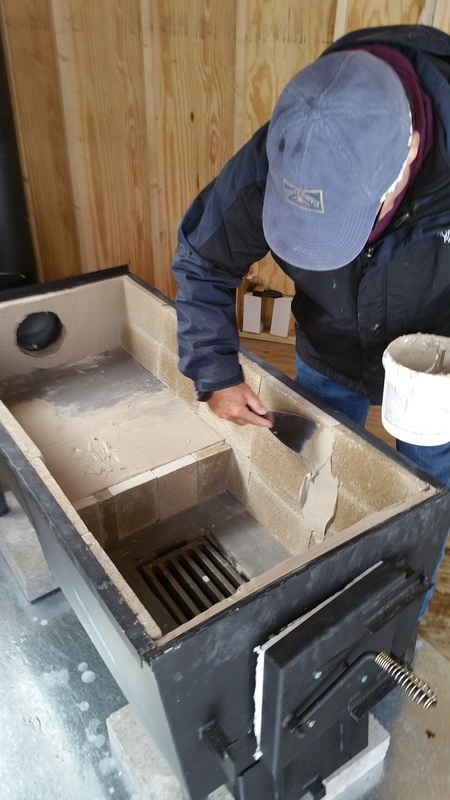 The firebrick had to be custom fit into the arch of the evaporator. 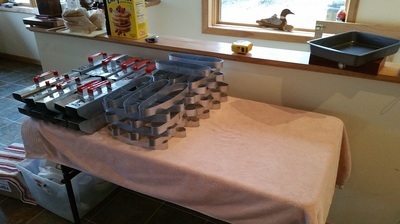 I bought a special blade for my miter saw in order to custome cut the firebricks. The instructions from Bill Mason’s website said the installation of the firebrick would take only 3 hours and could be accomplished by one person. Why did we take so much longer? I’m not sure why? However, a lot of the firebrick had to be custom cut in order to fit. 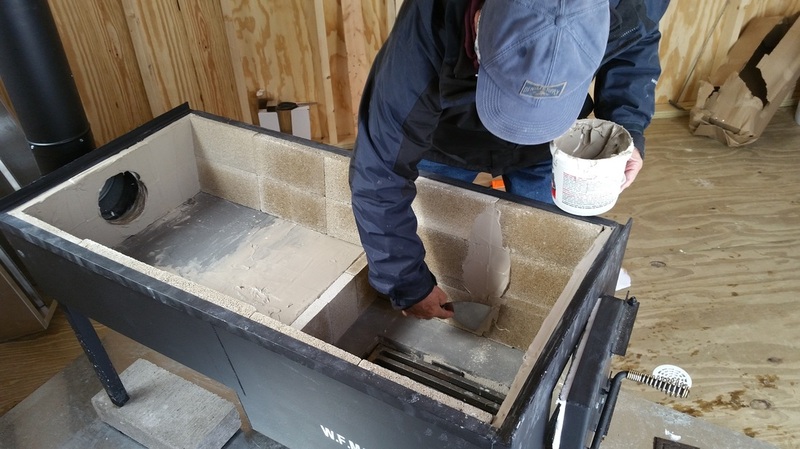 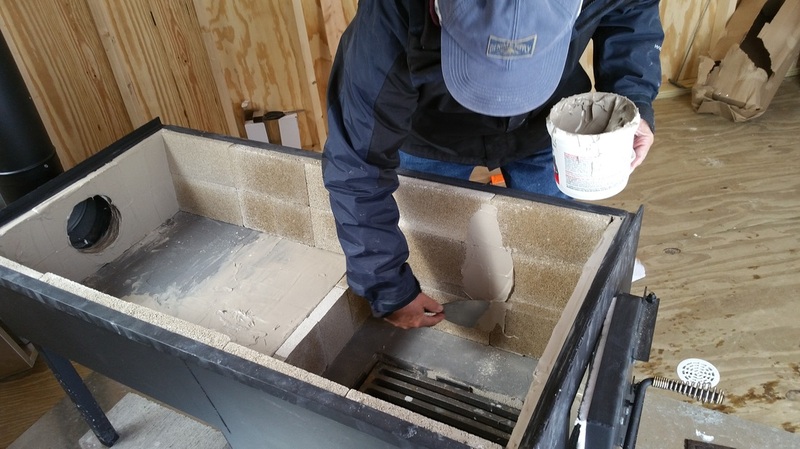 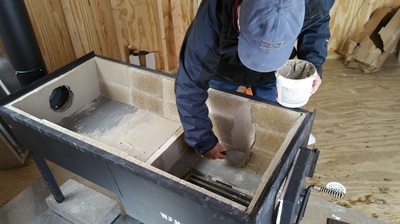 In addition, this is the first time Bill and I had installed firebrick in an evaporator as well as it was the first time that we had ever cut firebrick to custom fit anything. Fortunately we had the instructions written by Cindy Boles which were posted on Mason’s website. Even though her estimate of the installation time and the number of required firebrick was incorrect, her instructions were clear and great help. 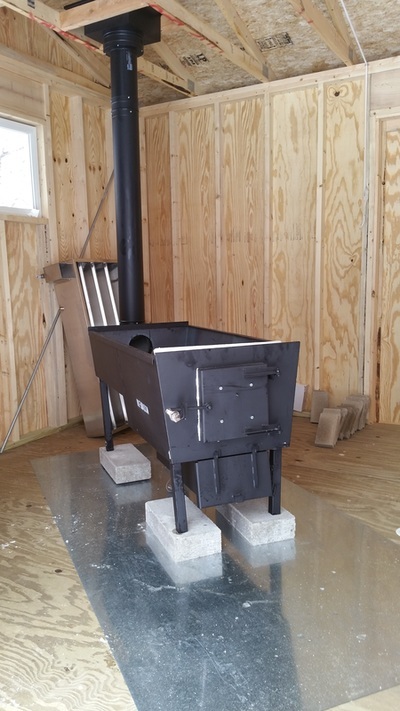 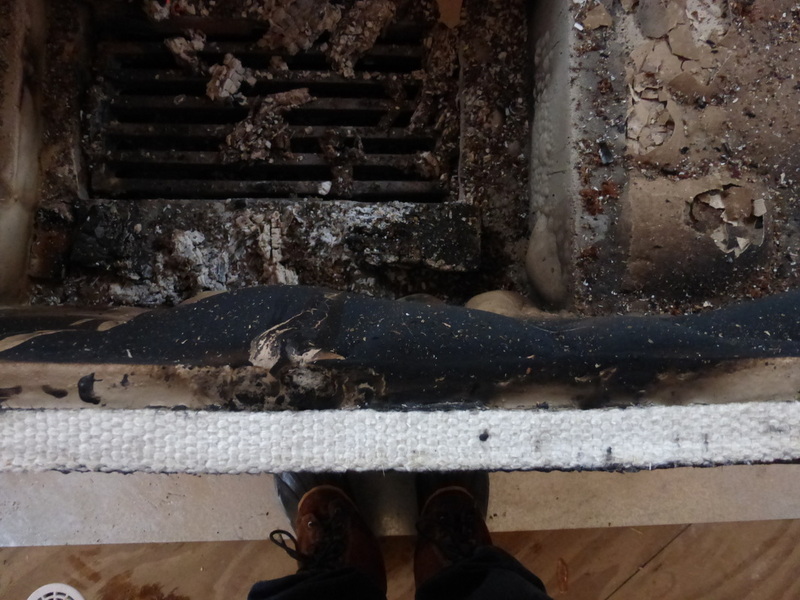 However, we did have to vary from those instructions, and the custom fitting of the fire brick into the arch of the evaporator took a lot of time and/or we took a lot of time to make sure that we got an excellent fit. I cut the firebricks and Bill installed the firebrick in the arch and finished the job by mortaring the firebrick. 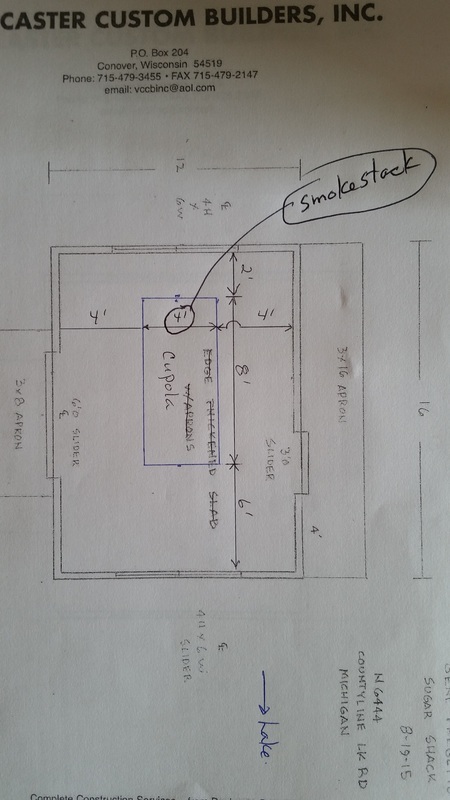 We made one mistake in mortaring the evaporator, but didn’t find the error until after building an initial fire in the arch. 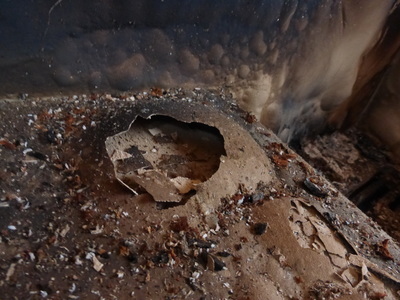 As the photographs show, much of the mortar “bubbled” and then cracked easily like potato chips. Later, I was told by an Ace Hardware sales person that we should have pre-wet the firebrick, because the dry firebrick absorbed the moisture from the mortar causing the bubbling problem. 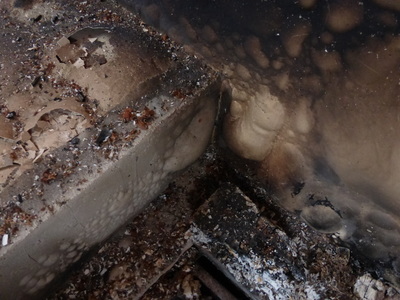 Fortunately, the firebrick remained in place during all boils for our first season. 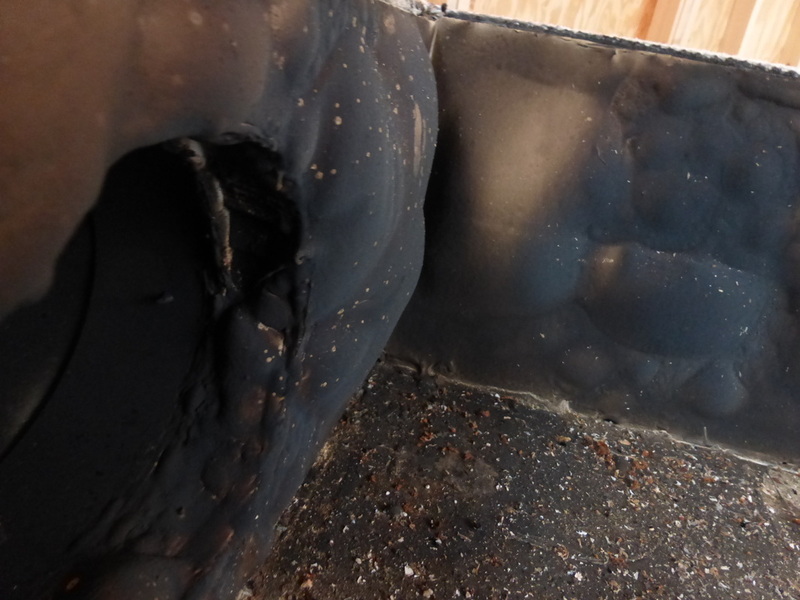 My job over the summer is to re-mortar the firebrick. Table for Evaporator – Even though the evaporator was properly installed in a well-built 12’ X 16’ Sugar Shack, one significant challenge remained: How to remove the 2’ X 4’ stainless steel “pan” filled with boiling hot “near” maple syrup from the arch filled with a red hot fire. 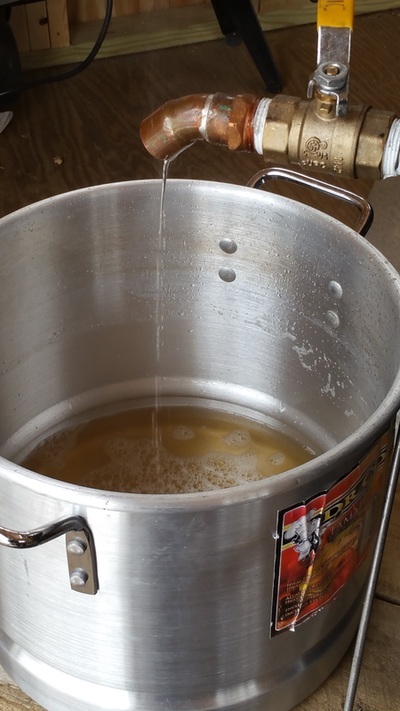 Essentially a “boil” reduces about 150 gallons of sap down to about 3 to 5 gallons of “near” maple syrup. The challenge is to promptly remove the “near” maple syrup before it boils over and becomes maple sugar. 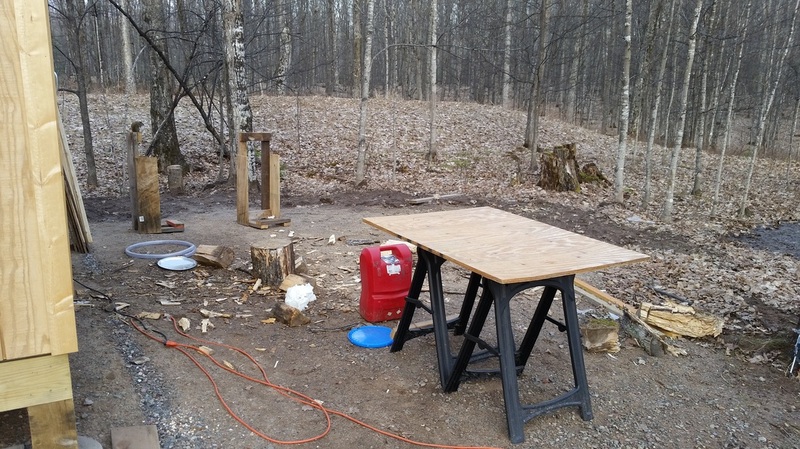 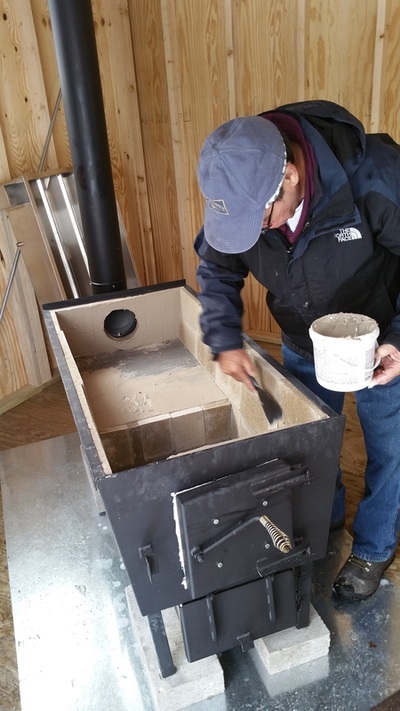 During the previous year, I made maple syrup with Bill Jarvi who has a 2’ X 3’ evaporator. 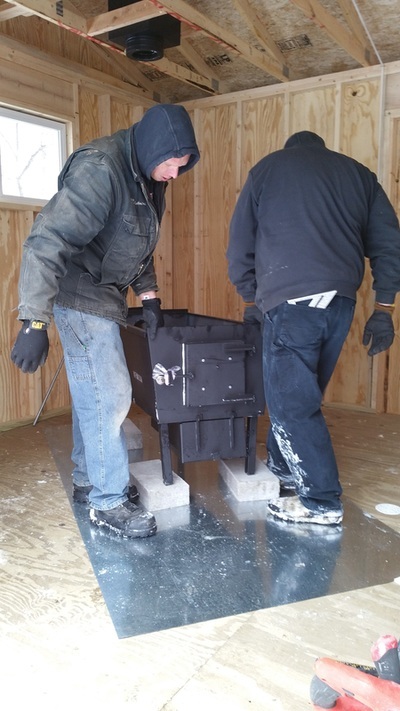 I helped him lift the “pan” off the arch many times, and it was a very easy task with two people. One time I did it myself and found that it was doable but challenging. 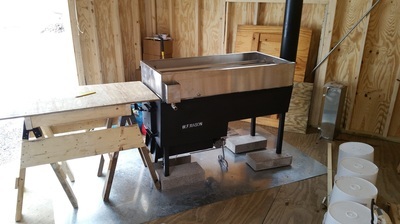 However, I knew that the 2’ X 4’ evaporator “pan” is 35 lbs. 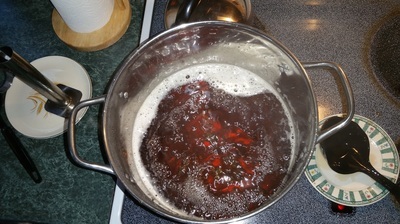 plus the “near” maple syrup which would be about 1” deep in the “pan” and would be equal to about 5 gallons of liquid weighing at least another 40 lbs. Even though, 75-80 lbs. 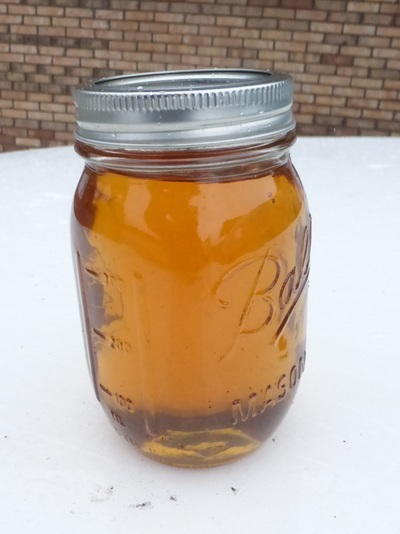 is “liftable,” it would very difficult handle a “pan” filled with boiling liquid at that weight when the pan had to be promptly pulled off the heat and tilted while opening the value to collect the “near” maple syrup. In addition, the larger “pan,” i.e., 2’ X 4’ versus 2’ X 3”, makes the “pan” more bulky and extremely difficult to handle for one person. Consequently, I decided to build a table with a metal top so I could pull the “pan” directly off the arch when the sap became “near” maple syrup. 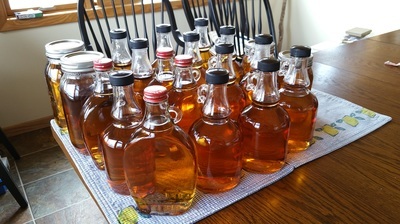 Once the “pan” was on the table, I could easily tilt the “pan” and open the value to collect the “near” maple syrup. 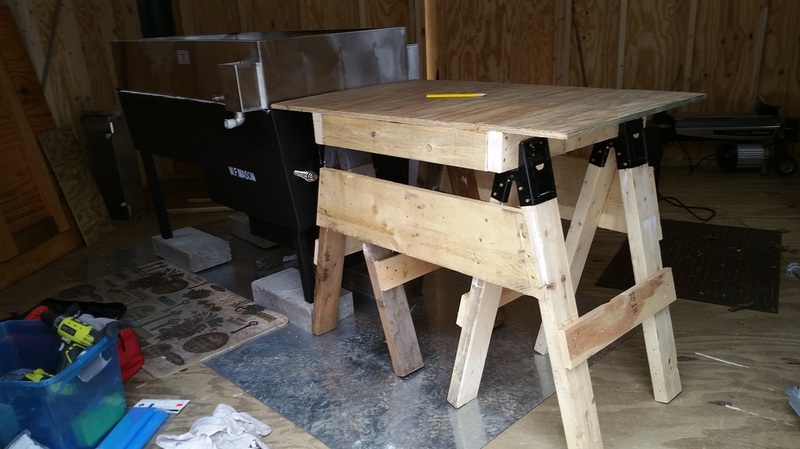 I made the table with the pallet used to ship the evaporator and scrape lumber from other projects. 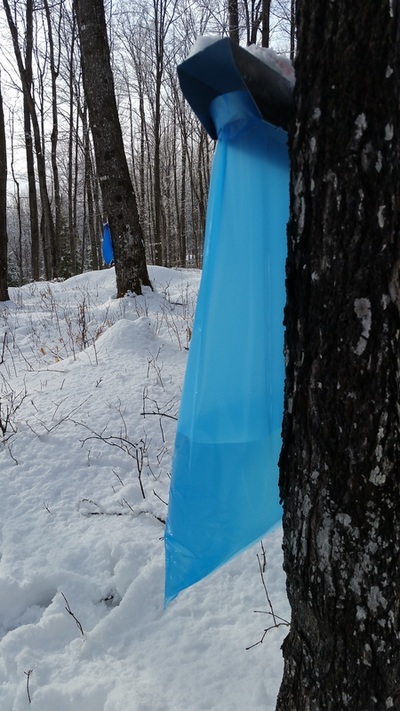 Sap Collection Bags – There are pros and cons about using the blue sap collection bags. 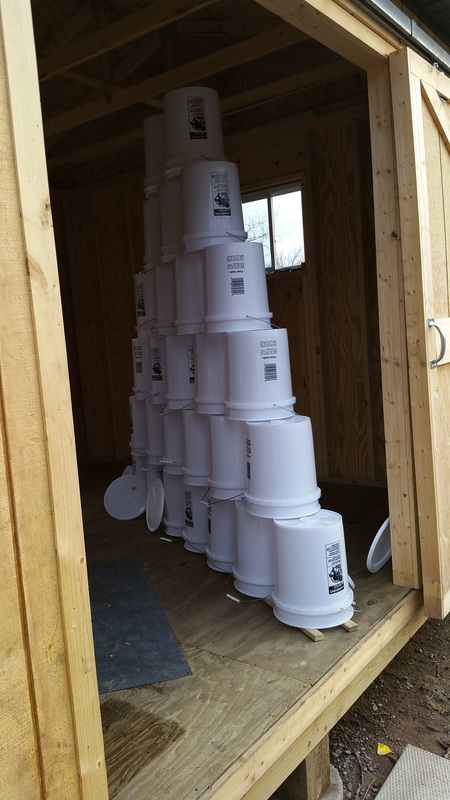 The initial cost of the metal holders and a supply of bags are a little cheaper than the initial cost of buckets giving the bags a slight initial cost advantage. However, you will be required to purchase new plastic bags every year so the initial cost advantage decreases with each season as the bags are not re-usable whereas the buckets are re-usable. 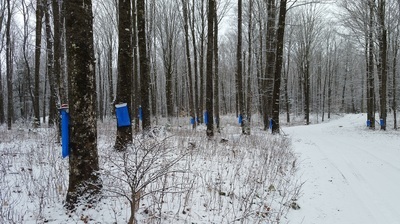 However, the advantage of the bags eliminates the need to clear and store the buckets until the next season. 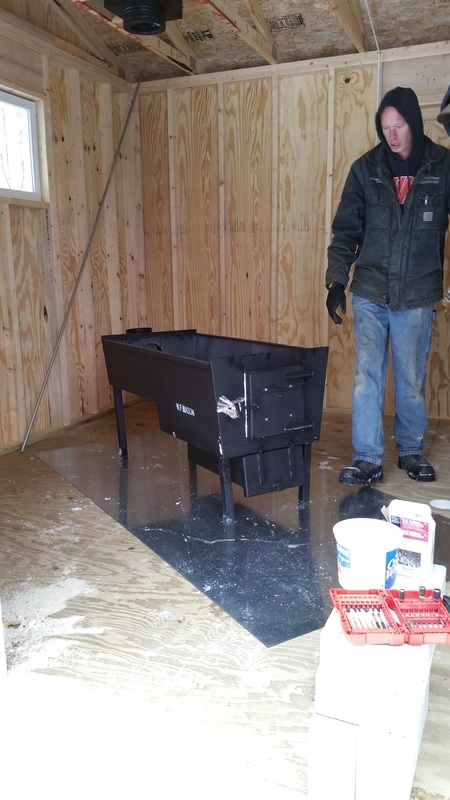 Having at least 80 taps, cleaning the buckets can take a significant amount of time and the storage requires considerable space. 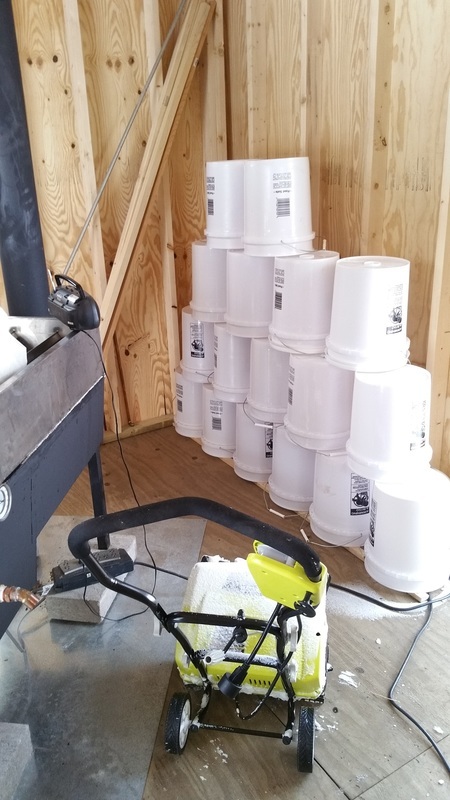 One significant advantage of the buckets is emptying the buckets of “aged” frozen sap. 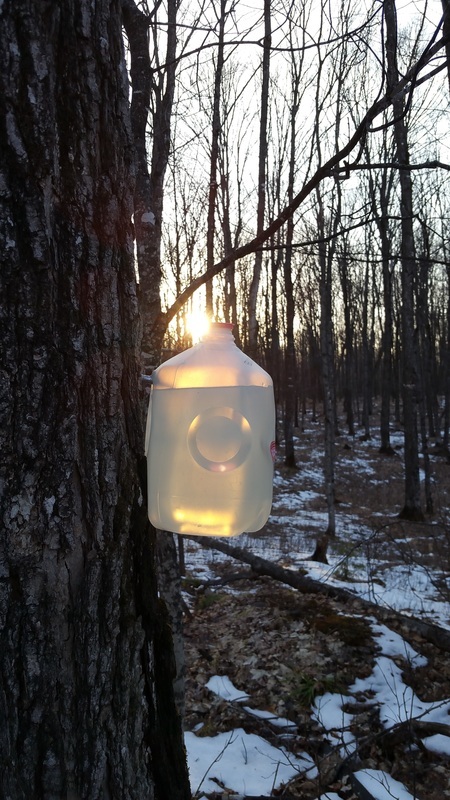 There will be days during the season when the sap slows down and your trees will not produce enough sap for a boil. Normally, I need at least 120 gallons of sap to have a satisfactory boil. 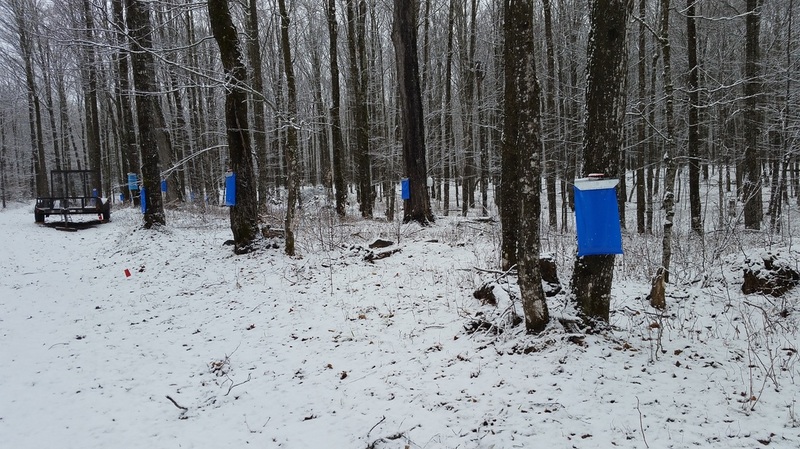 During those days when the sap run slows, freezing weather might persist for a few days and the sap in the bag or bucket will freeze. Since the sap has “aged,” you will want to clear the bag or bucket of the frozen “aged” sap so your collection will only contain “fresh” sap. It is much easier to clear a bucket of “aged” sap than it is from the bags. 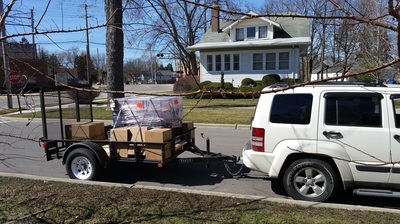 A pro of using a bag is its capacity. Bags, if properly inserted in the metal hanger will hold nearly 5 gallons of sap! 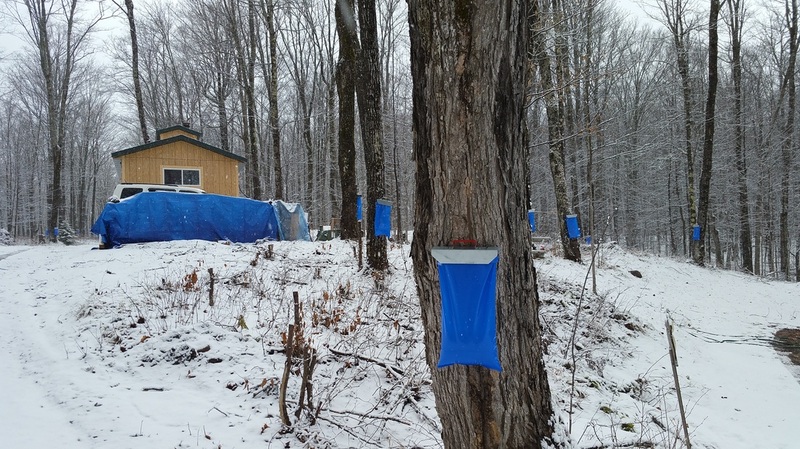 Another pro of using bags is that it is easy to tell which trees need to be collected. 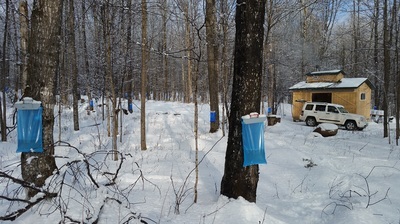 Since all trees do not produce sap at the same rate, a visual inspection from a modest distance can determine whether a bag is in need of collection. 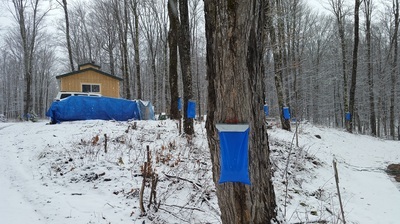 The con of using bags is that leaks can be created in the bags during windy days as the wind will “slap” the bag against the bark of the tree causing small punctures. 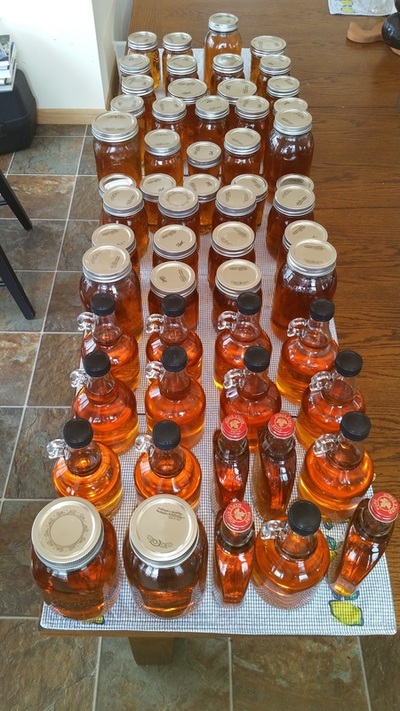 Last season, I had ten spare bags and used all of them. Overall, I prefer the bags. 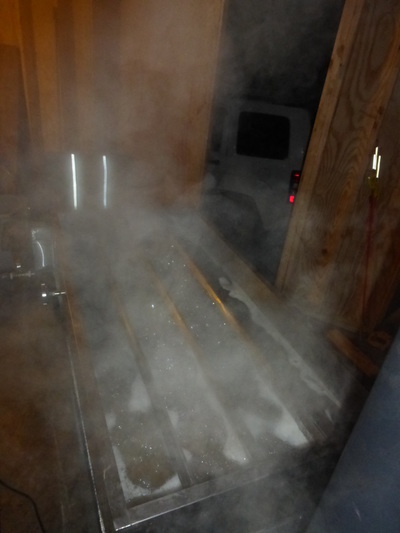 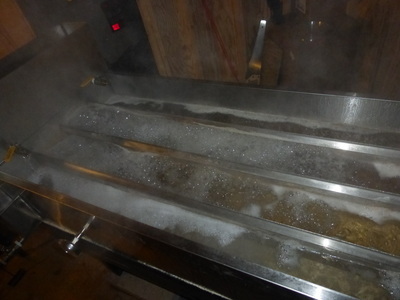 Evaporator at Boiling, i.e., Boiling the Sap – The heart of making maple syrup is the evaporator. Last maple syrup season in 2015, I was fortunate to have Bill Jarvi, a neighbor on County Line Lake, be my mentor. Bill has a 2’ by 3’ evaporator or six square feet of boiling surface also built by William F. Mason. 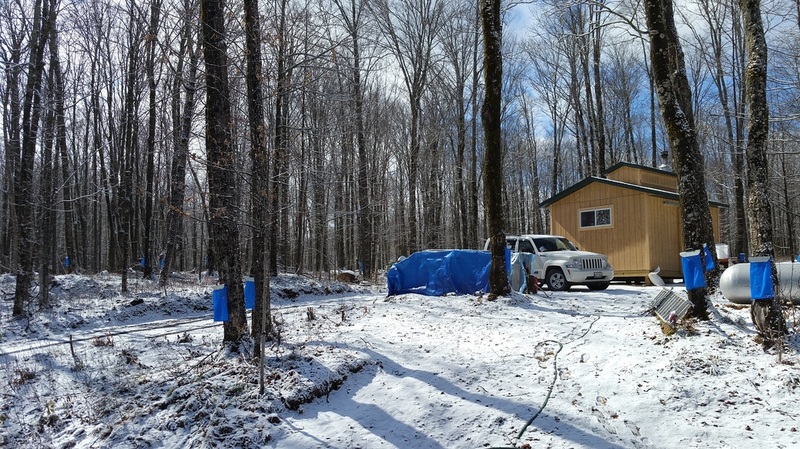 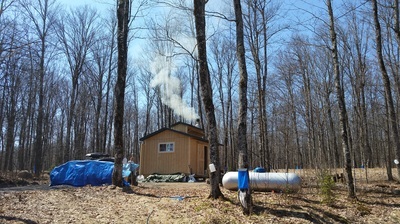 Bill recommended that I get Mason’s 2’ by 4’ evaporator, eight square feet of boiling surface, due to fact that my property is filled with sugar maple trees so I could use the additional capacity. 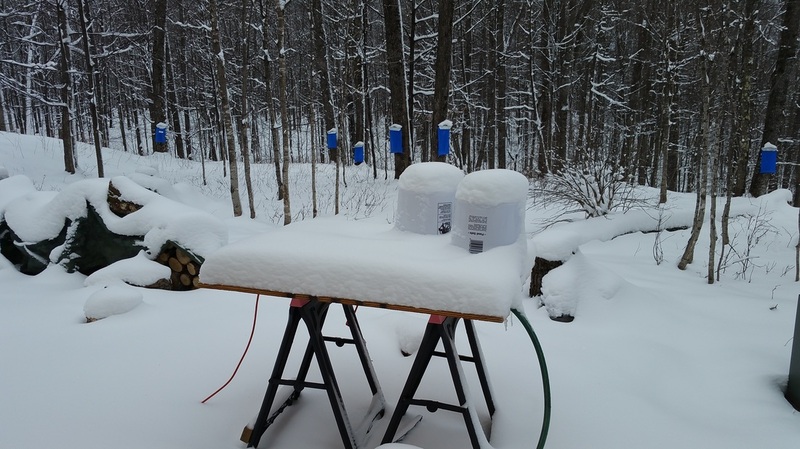 After completing my first season, I am glad that I took his recommendation, because I had 83 taps that would easily produce up to 150 gallons of sap in a day when the sap was running well. 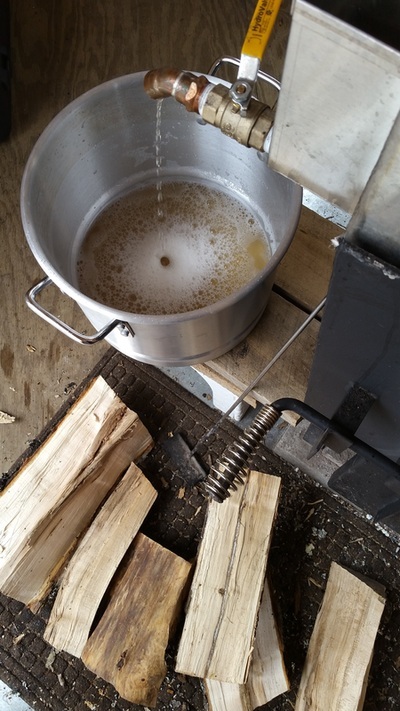 Consequently, for four straight days, I boiled about 140 gallons of sap per day and collected about the same amount to start another boil the following day. 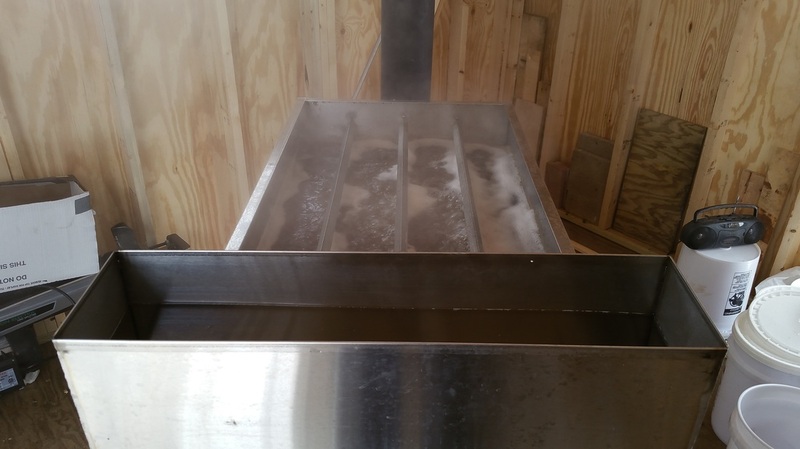 Small Batch Processing – I’ve thought about the best way to describe the rationale behind the small batch processing of maple syrup to determine the best starting point to explain the process. 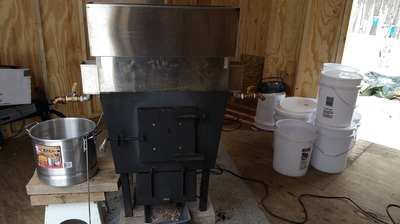 Do I start with the inputs, i.e., the trees, the output, i.e., the number of gallons of maple syrup I want at the end of the season, or the size of the evaporator pan? 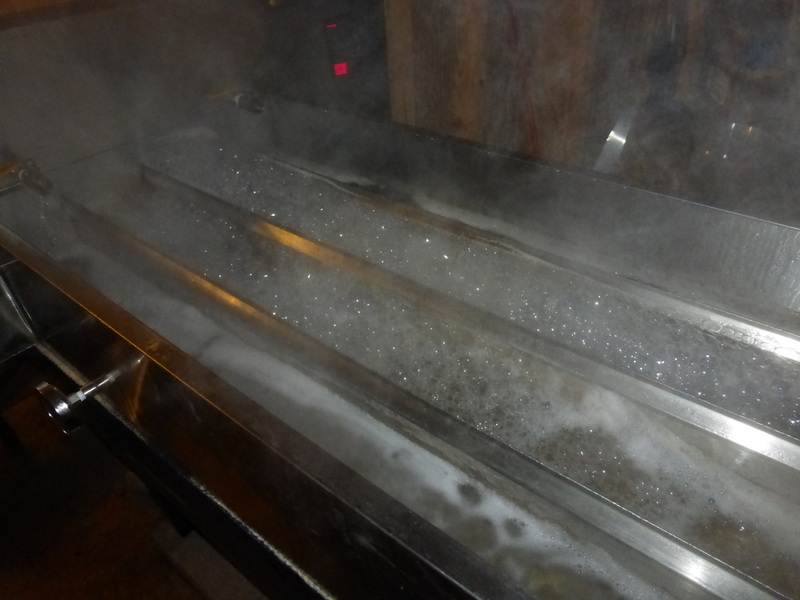 After some reflection, I decided to begin with an explanation of the size of the evaporator pan. 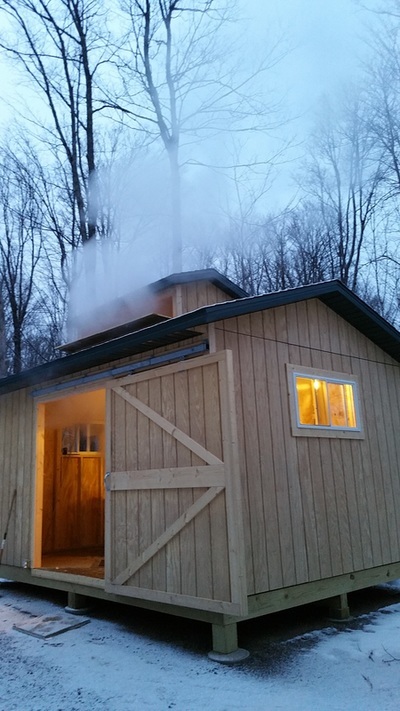 Bill Jarvi gave me an excellent recommendation to purchase a 2’ by 4’ evaporator giving me 8 square feet of evaporating surface. 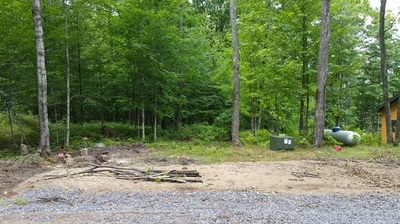 The 8 sq. 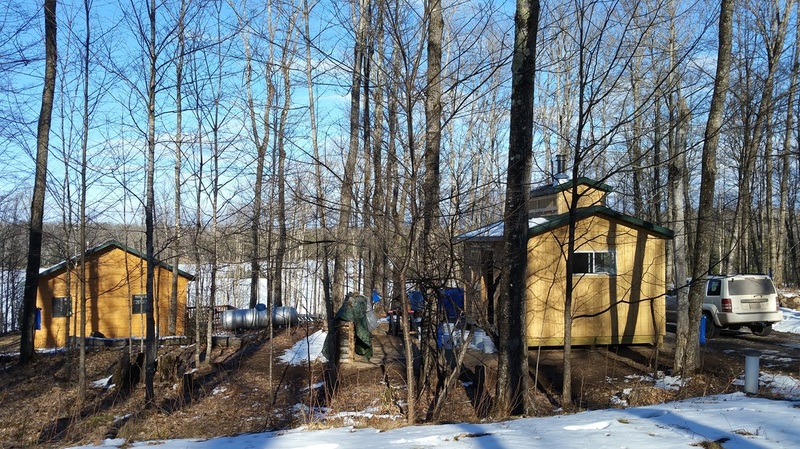 ft. surface also defines other critical elements of the maple syrup process including the number of tapped trees, the size of the sugar shack, and the output capacity which in turns defines the capacity needed to finish and bottle the maple syrup. 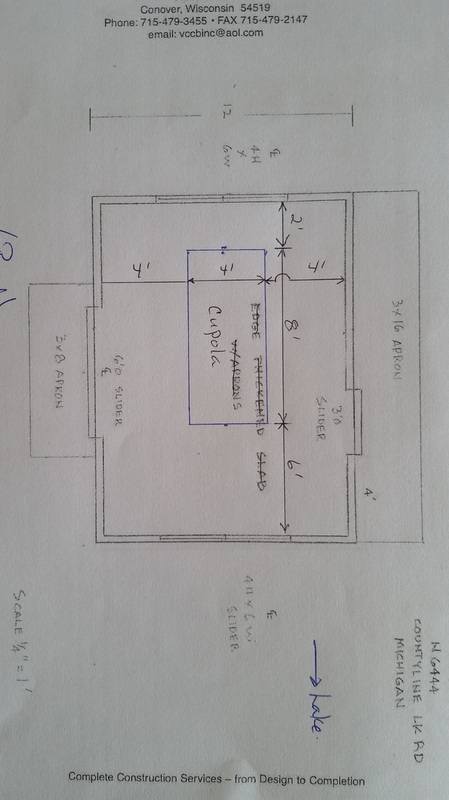 Let me explain. 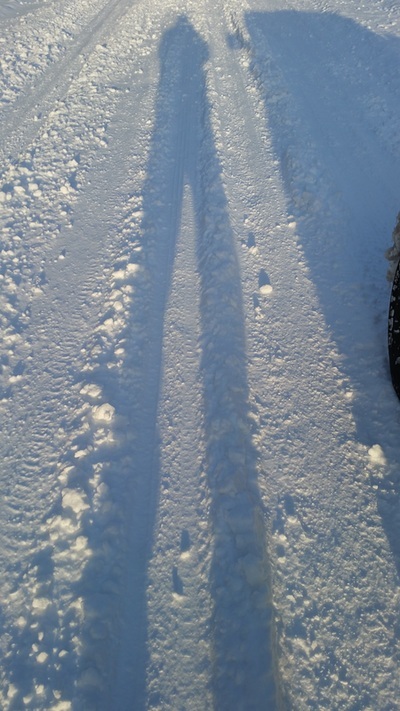 The 8 ft. sq. surface is considered the high-end of the hobbyist range, because it can service about 100 to 120 taps. 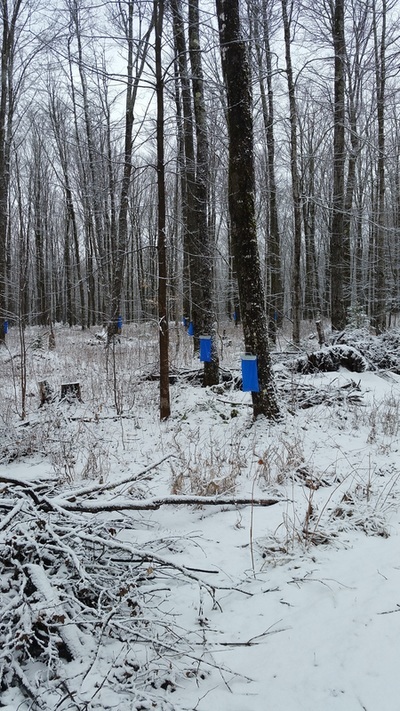 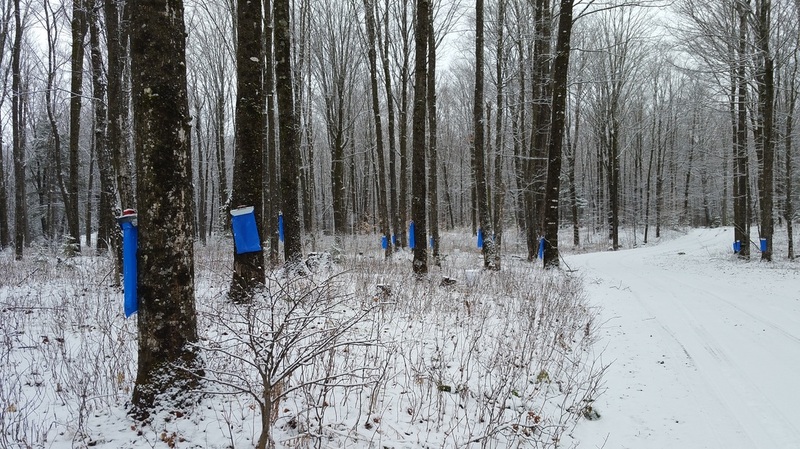 On a good day, about 200 gallons of sap could be collected with about 100+ taps. Since the boiling rate is generally 10 gallons of sap per hour, it would take about 20 hours to boil a day’s collection. 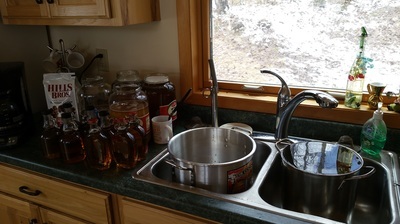 If the sap runs well for several consecutive days, the hobbyist would have about a four-hour break to clean-up and prepared to the next day’s boil. 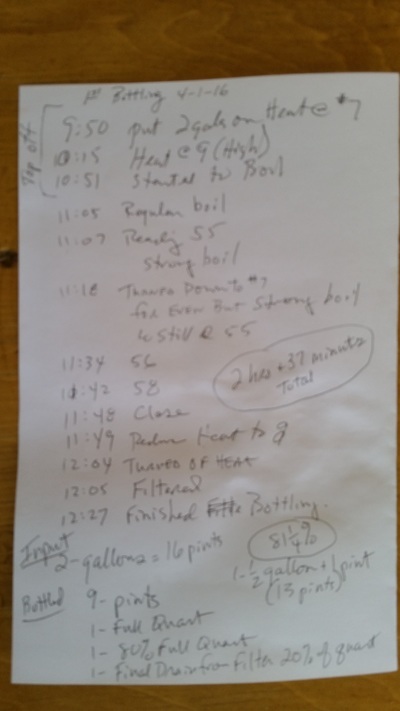 Now you have some insight regarding my choice to have 82 taps. 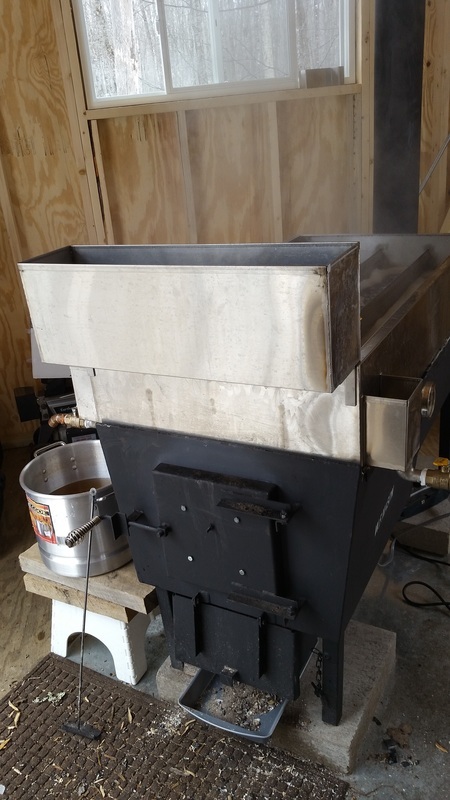 Although, it certainly is possible to process of batch of 200 gallons, you would want a lot of family and friends to help you collect sap and tend the fire as well as to clean-up after the batch and get ready for the next batch as the hobbyist evaporator is not designed for continuous feed. 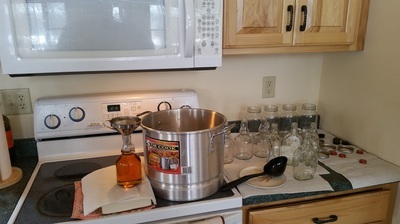 In addition, if the 2’ by 4’ evaporator was used to its maximum, the hobbyist could produce nearly 30 gallons of maple syrup per season which is well beyond personal consumption and use for parties or gifts. That quantity, 30 gallons, would certainly be reasonable if you had a lot of family and friends helping you for freshly harvested maple syrup as their compensation. However, 30 gallons is not sufficient to warrant establishing a retail sales business. Also, manually collecting nearly 2,000 gallons of sap and furnishing wood to boil the 2,000 gallons of sap would be very demanding for a few people. 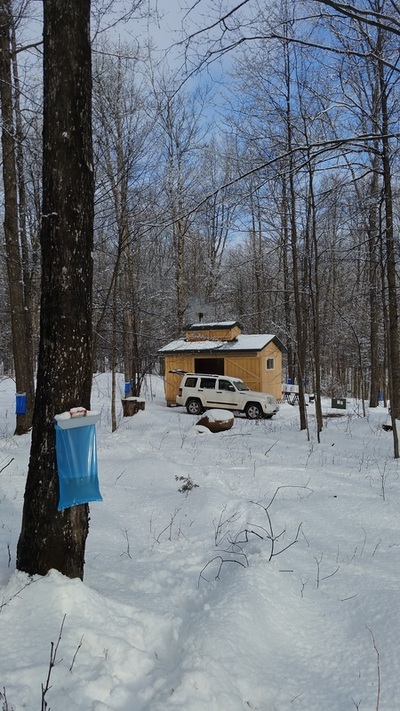 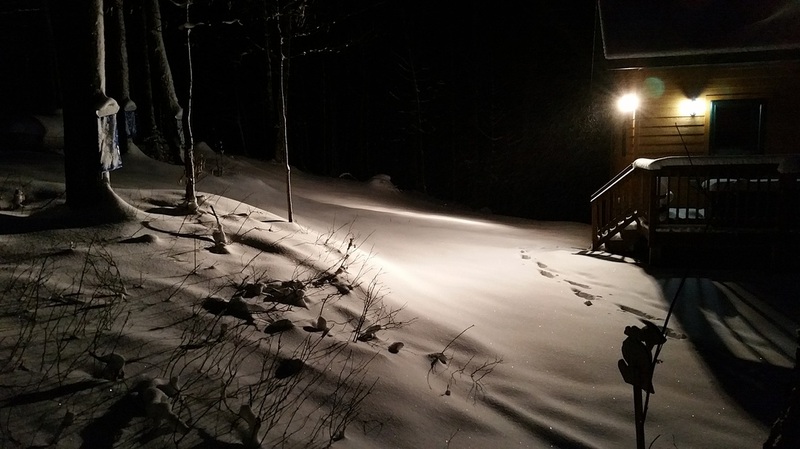 Sugar Shack – Determining the size and location of the Sugar Shack was a considerable task as well as expense. 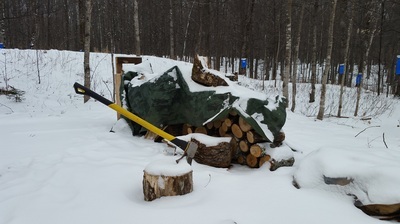 Fortunately, I had the money but had to decide whether to leave the money in the bank for my children to inherit or to spend the money on a Sugar Shack so we can enjoy the money together. 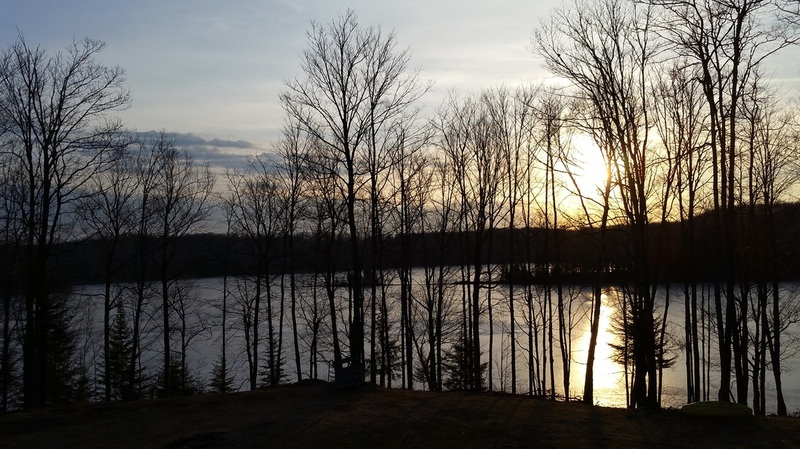 When I framed my concern about saving money within these parameters, the decision to spend the money was very easy. 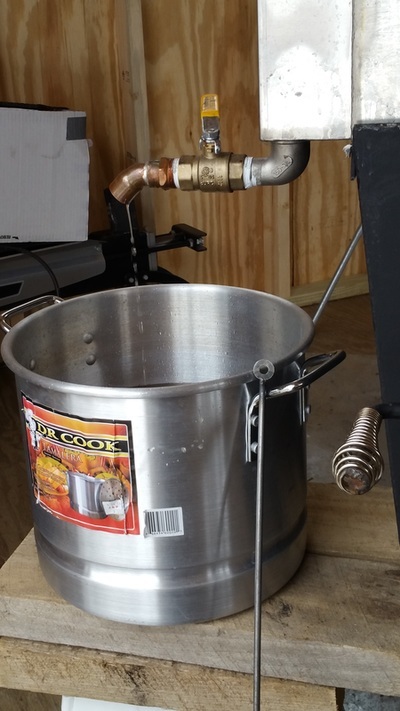 There was a low cost alternative. 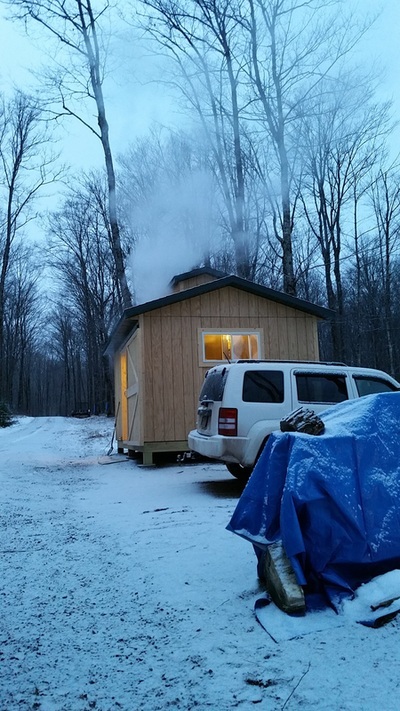 I could have constructed a simple roof structure to cover the evaporator on the lower level in front of our lake home, but exhaust from the wood fire would have infiltrated our home and evaporator would have been fully exposed to the cold spring temperatures thereby lowering the boiling capacity of the evaporator. Also, there would be a need to install and uninstall the roof structure every year and a need to store the roof structure someplace on our property. 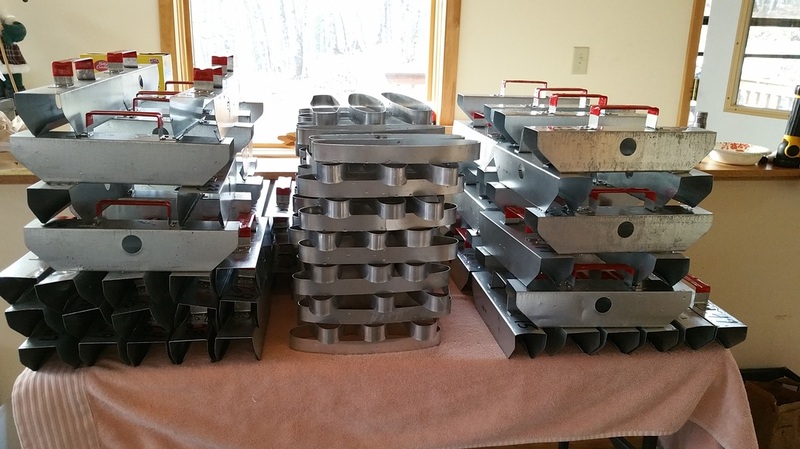 Needless to say, the task of assembling and un-assembling the roof structure every year would be an arduous task and would become more difficult as the years passed. 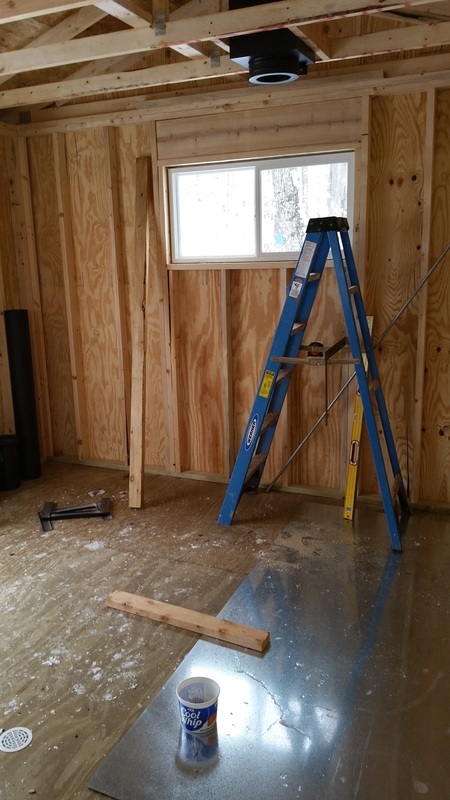 In addition, I did want a regular work area for other projects during the off-season. Consequently, a Sugar Shack would be the best choice. 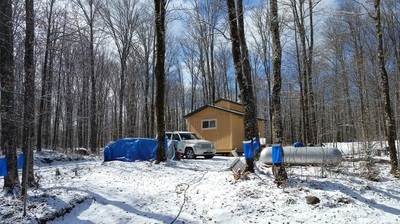 Once the construction of a Sugar Shack was selected as the best choice, the question of the correct size became important. 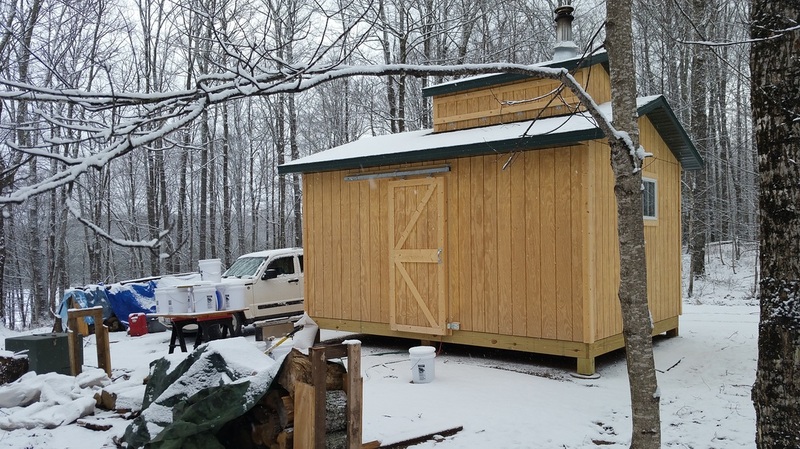 Fortunately the maple syrup literature had excellent guidelines for the size of a Sugar Shack that is needed for a 2’ by 4’ evaporator. The literature recommended a 12’ by 16’ Sugar Shack. Surprisingly, this size of Sugar Shack is just under 200 square feet which is the maximum size for a shed in Watersmeet Township. 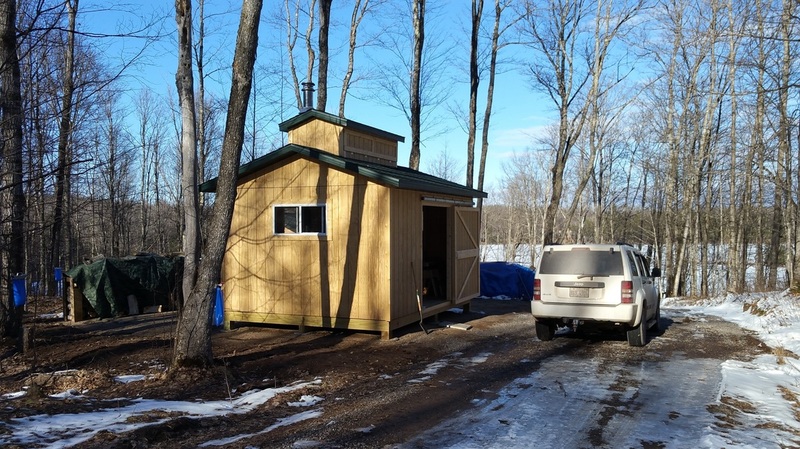 Consequently, I would not need a building permit to build the Sugar Shack, but I did verify this with the Township building inspector. 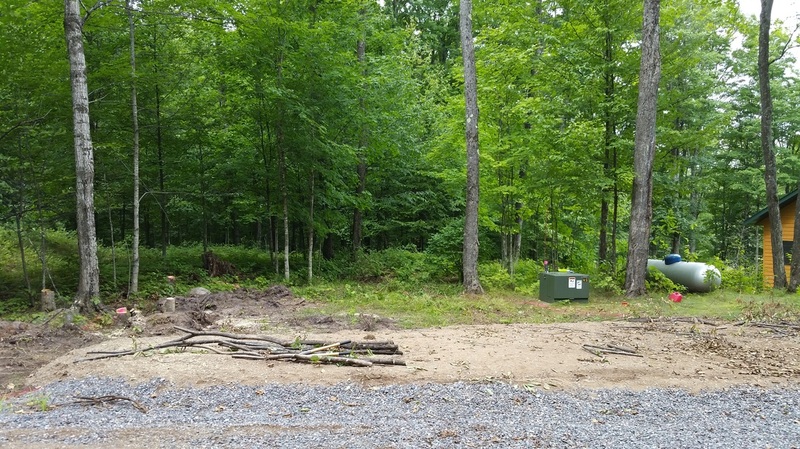 I shared my Sugar Shack plans with the Watersmeet Township building inspector, and he confirmed that 200 square feet was the allowable size of a “shed” that did not need a building permit. 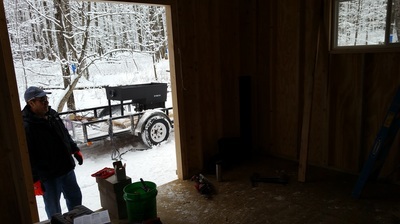 However when I told him that I was going to place the Sugar Shack on a concrete pad, he said that Watersmeet Township was the exception to nearly all other locations in the state of Michigan where it was allowable to construction a shed of 200 square feet or less on a concrete pad. 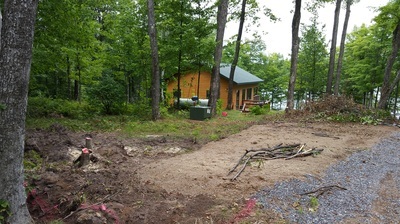 In Watersmeet Township, the construction of a building on a concrete pad is considered a “permanent” building and would require a building permit. 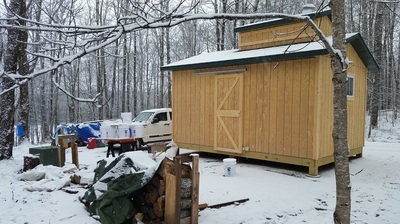 Since a building permit would be required for the Sugar Shack on a concrete pad, I thought that I would then build a larger building since I needed a building permit anyway. 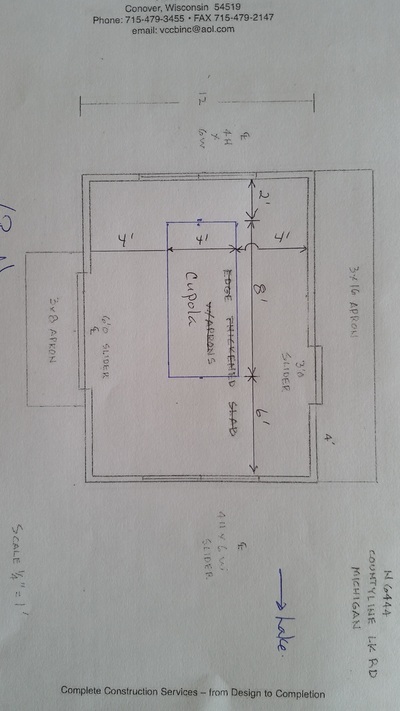 Consequently, I started to design a building the size of a garage. However, as I began to layout the garage-size Sugar Shack on the site that I had chosen at the top of the hill just west of our lake home. The site would have to be much larger plus additional land would also have to be cleared causing the price to escalate greatly. 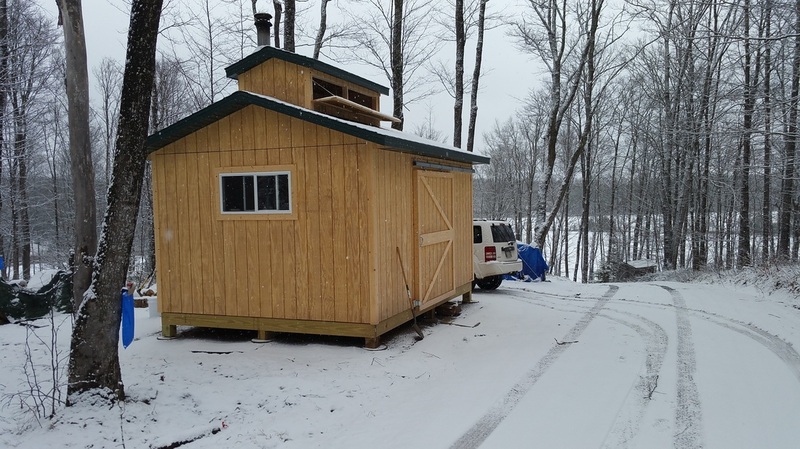 In addition, the code restrictions on our property allow for only one additional building on our property and the garage-type Sugar Shack would be that building. 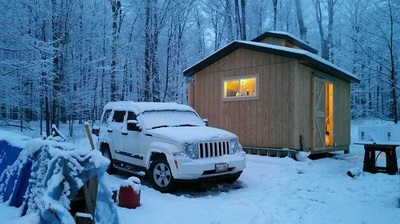 Since I did not want to invest in a major building and eliminate future building on our land, I chose to return to my original desire to have a shed. 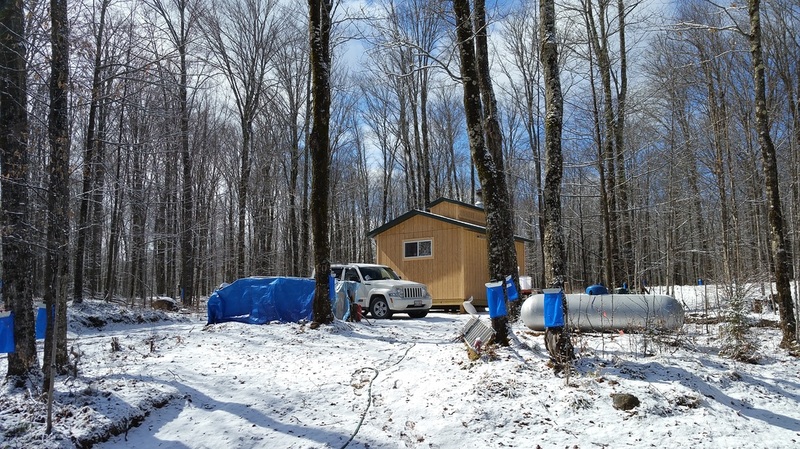 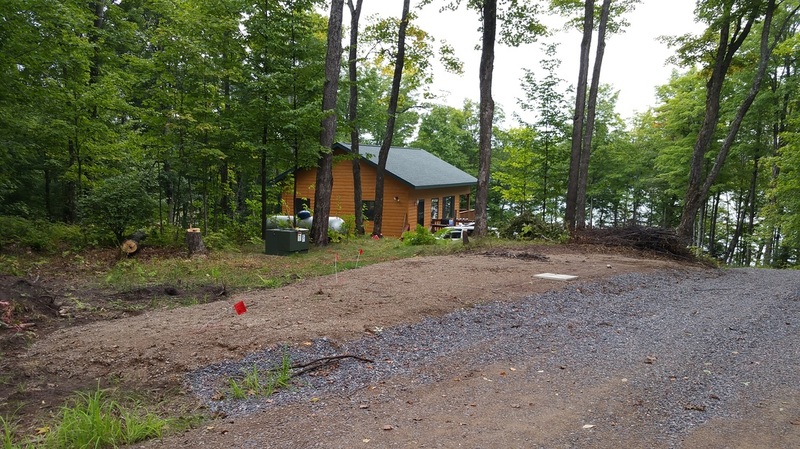 Consequently, the Sugar Shack was to be built on concrete pillar and could easily be moved to another location on our property should I want to use the same location for a second structure. 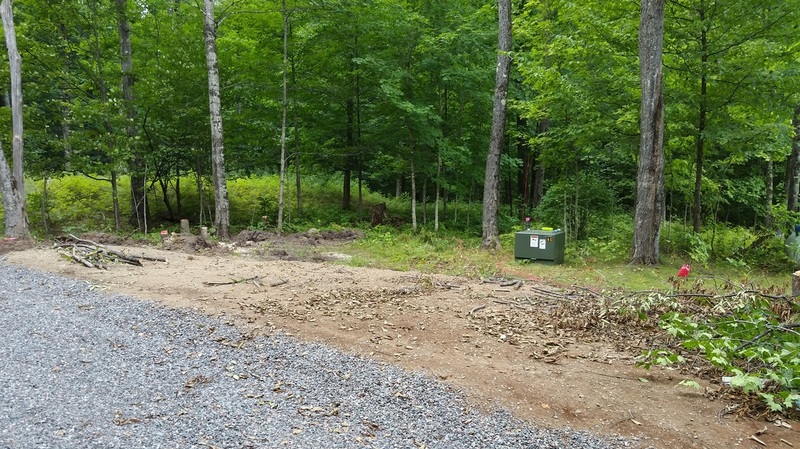 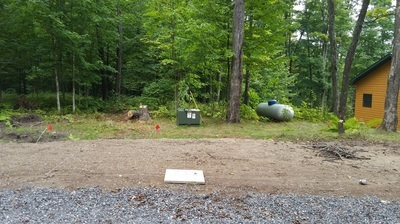 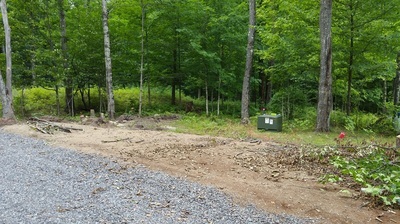 In addition, the selected location of the Sugar Shack was within 15 feet of the electrical power box and a larger building would have required the relocation of the power box and electrical line to our house if a permanent building was to be constructed at that site adding to the overall cost of the Sugar Shack. Needless to say, I returned to my original desire of having a 12’ by 16’ Sugar Shack and was willing to have it installed on concrete pillars rather than a concrete floor. 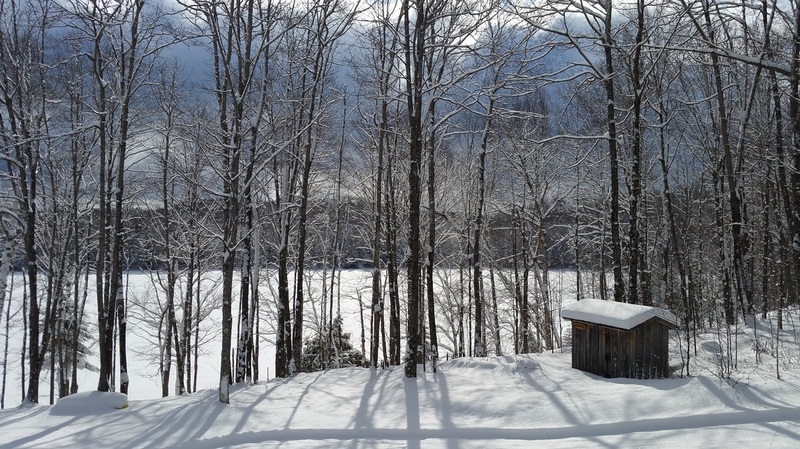 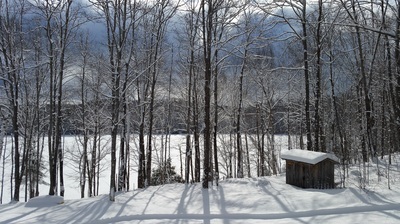 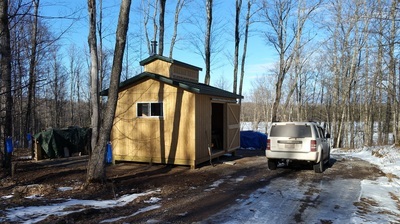 I contracted with the builders of our lake home, Van Caster Construction from Conover, to build the Sugar Shack. They did a terrific job! 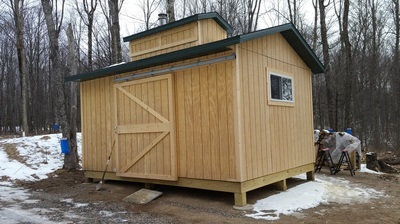 I gave them construction information about building a Sugar Shack from the maple syrup websites. The unique aspect of a Sugar Shack versus a shed is the cupola and they did a terrific job of building my Sugar Shack according to the specifications that I provided. Sugar Shack Site - The other expense of installing the Sugar Shack was the preparation of the site. 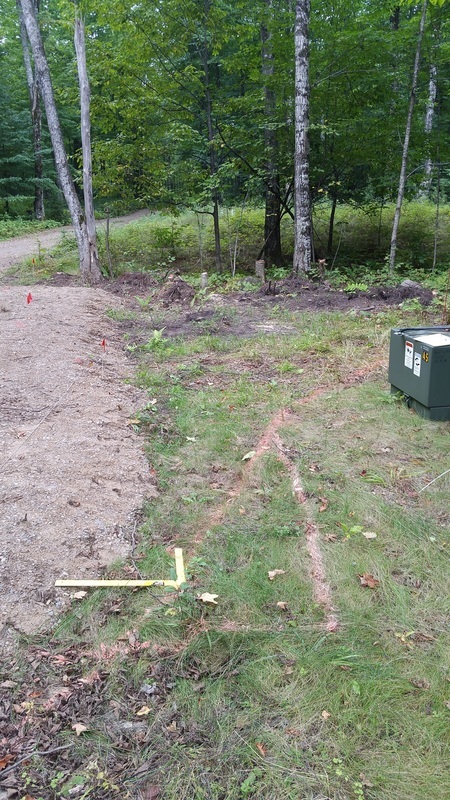 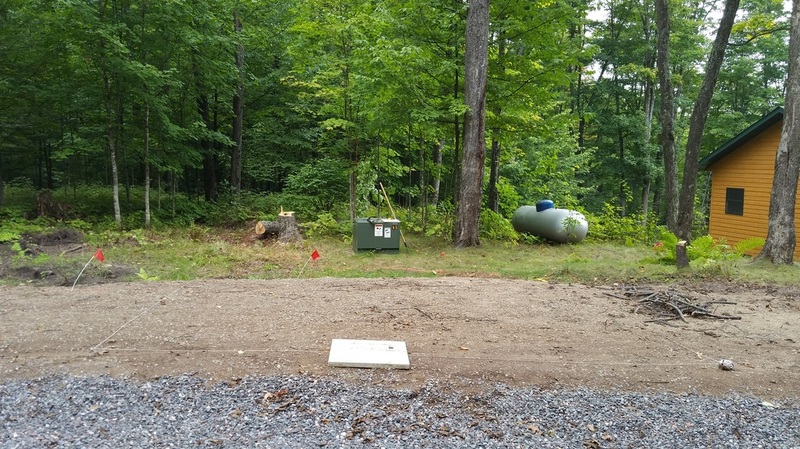 My chosen site was about 15 feet west and 15 feet south of the electrical power box. 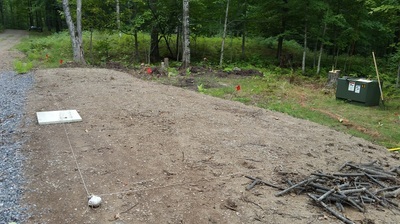 The site was a low area and a bit marshy with very soft earth and collected a lot of water during rainy times. 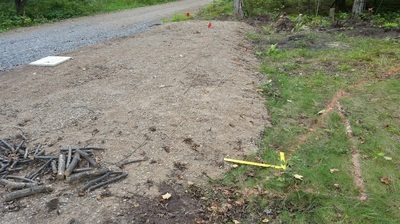 Consequently the whole area had to be dug up down to solid earth and back-filled with solid gravel and compacted. The cost of doing this was well over $1,000. 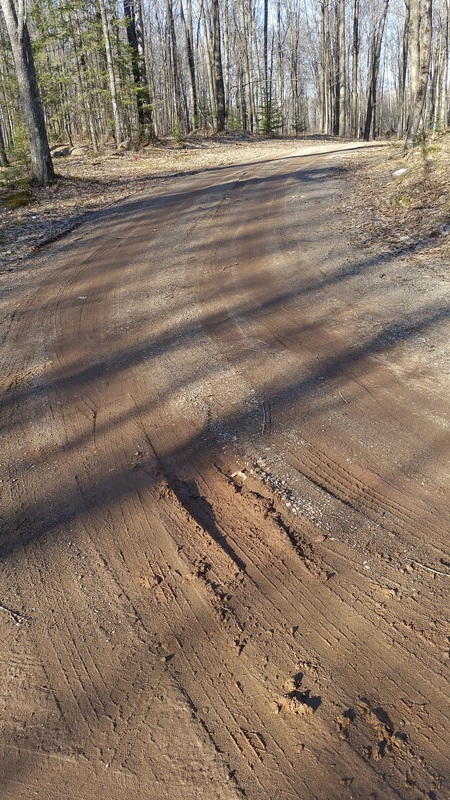 Road to Sugar Shack - In order to travel my driveway during early Spring when the snow is melting, my driveway had to be re-graveled. 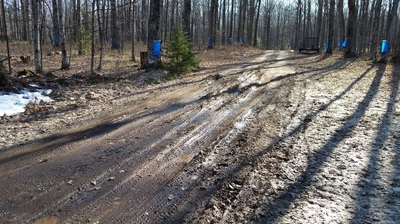 During the previous year (2015) when I made maple syrup with Bill Jarvi, many parts of my road became impassable due to the water runoff of the melting snow. Previous to 2015, I always came to our lake home after spring thaw and never experienced the water runoff. 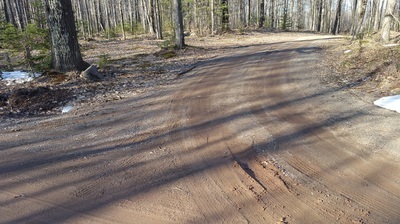 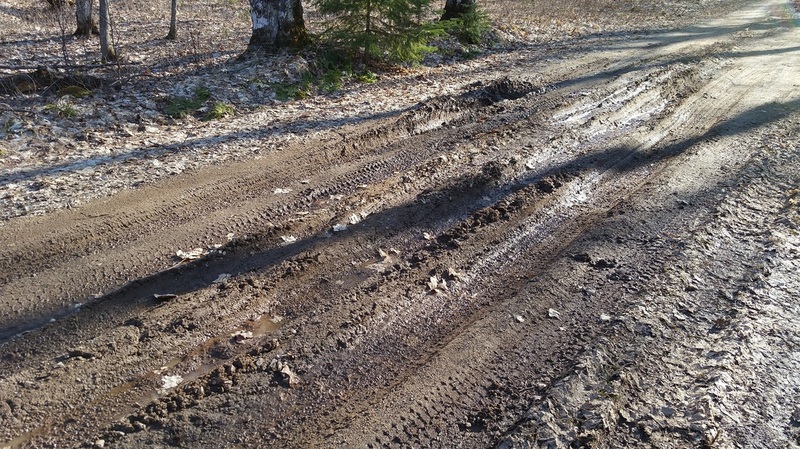 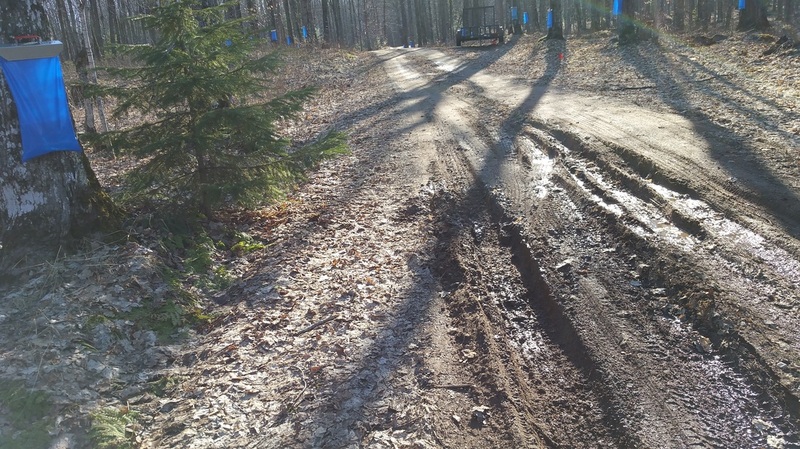 However, during the 2015 maple syrup season when I boiled with Bill Jarvi and harvested sap from trees on my property, the water runoff make my entry road a mud-hole in several locations. Consequently, I needed to have my road vastly improved for use during the spring thaw. 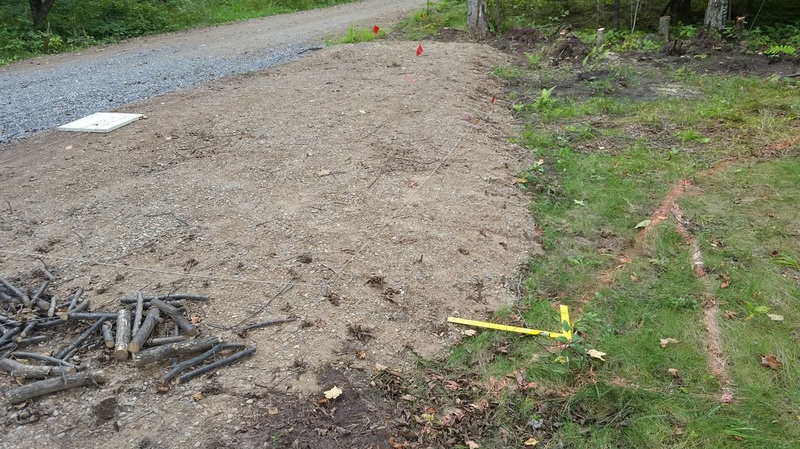 I hired a local contractor who did what I thought was a great job. However, the following spring, the Spring of 2016, uncovered a fatal flaw in their road work: They did not provide for a gutter on the south side of my driveway. 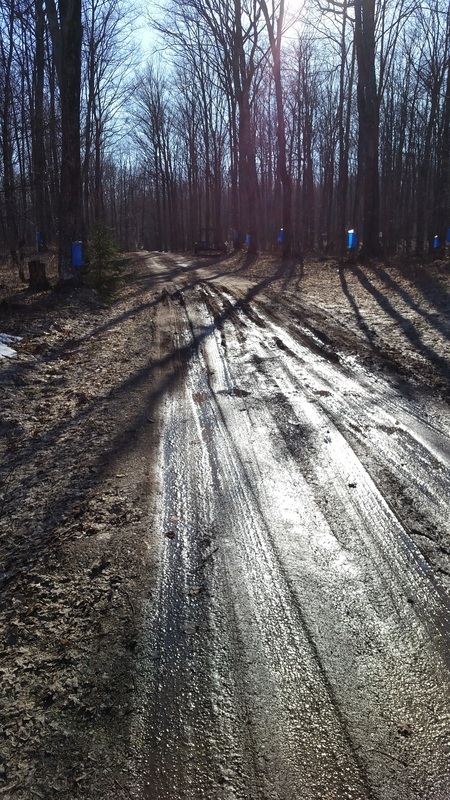 Consequently, the water from the melting snow washed across two different areas of my driveway making it almost impossible to drive through. 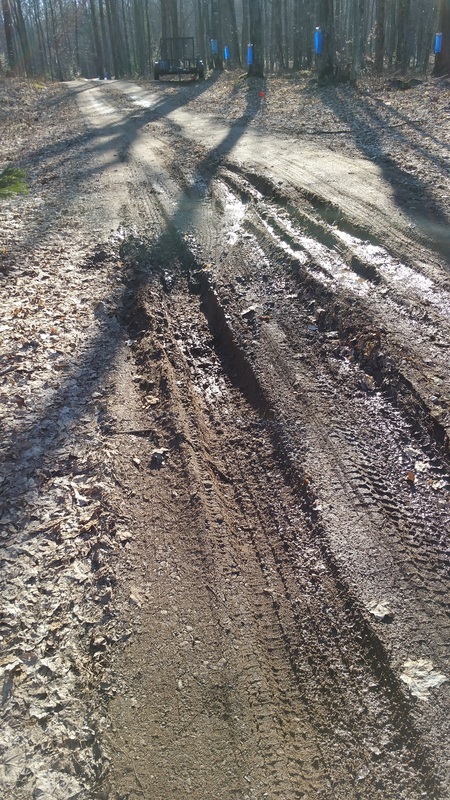 Presently, I am seeking quotes for work to create a gutter on the south size of my entry road so the water does not have to cross my entry road and create significant soft spots that would require a four-wheel drive vehicle to transverse. At this time, there are at least two locations and a potential third location where addition gutter work needs to be completed in order for my entry road to remain solid during maple syrup season. Bottling Maple Syrup – Maple syrup is not produced in the Sugar Shack with the evaporator. Only “near” maple syrup is produced in the evaporator. Why isn’t the final maple syrup produced in the evaporator? Simply stated, one cannot control the temperature of the fire as the heat is provided by the open and uncontrollable burning of hardwood. 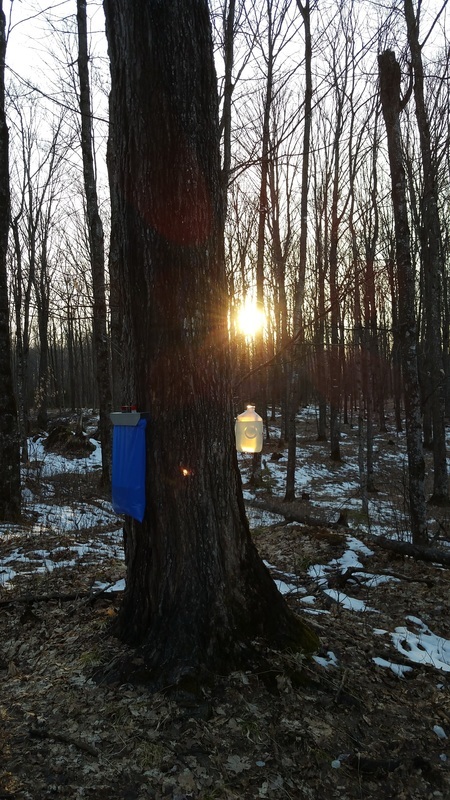 With skill and an even temperament, 140 gallons of sap, which ranges from 2% to 5% maple syrup, can be reduced to an estimated 95% maple syrup. However, any attempt to reduce the water content to get pure maples syrup over the uncontrollable intense fire is very tenuous, at best. The depth of the liquid in the 8 sq. 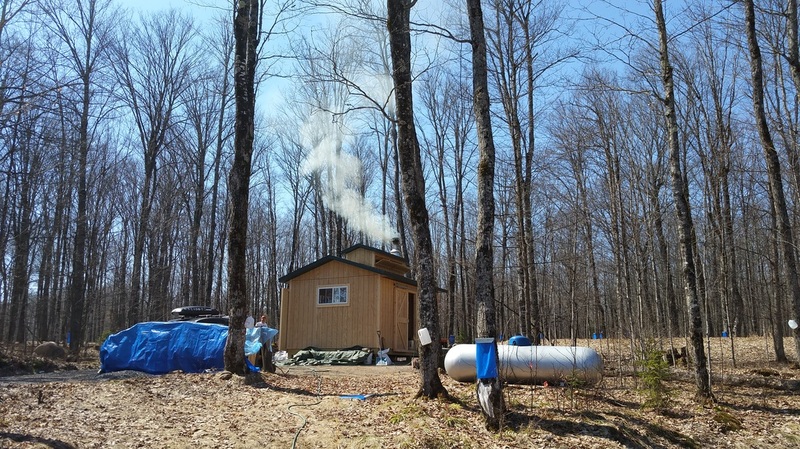 ft. “pan” is less than an 1” deep, and the likelihood of hot spots flaring up to create maple sugar due to over-boiling is great. 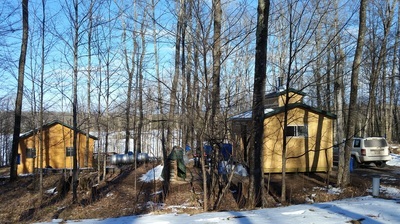 Consequently, a slower and more controlled heat is needed in order to reduce the water content of the “near” maple syrup to a zero. 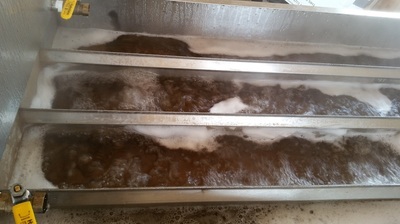 In order to eliminate all water from the “near” maple syrup and to eliminate much of the sugar sand, the “near” maple syrup must be drained from the evaporator “pan” and filtered through a cloth filter. After this initial filtering, the “near” maple syrup is left to settle in a five gallon bucket overnight. 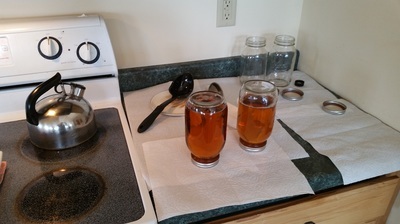 After settlement, the “near” maple syrup will be poured into gallon jars, used gallon-size pickle jars are excellent vessels for this purpose. 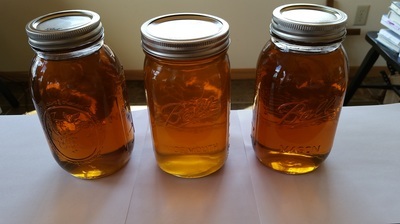 A typical boil will produce two or three gallon jars of relatively clear “near” maple syrup and one jar that contains a lot of sugar sand, i.e., niter. The separation of “near” maple syrup that has nearly no noticeable niter from the remaining “near” maple syrup with a lot of visible niter is very important to the finishing process that occurs over a controlled heat, i.e., a kitchen stove or equivalent controllable heat source. 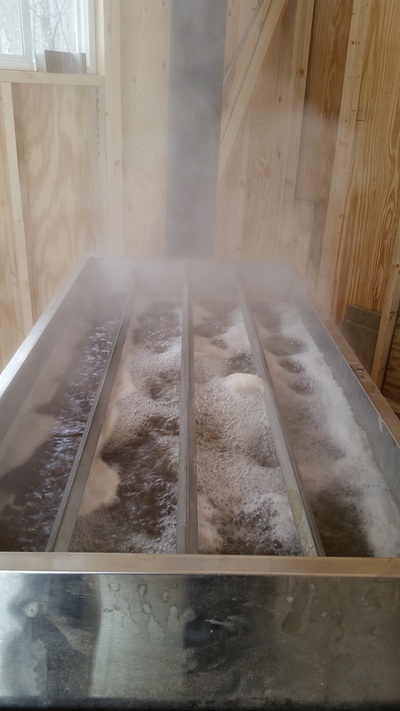 Filtering – For a small batch producer, i.e., a hobbyist, filtering is very important. The first filtering occurs at the collection point. Since sap is collected from the forest of sugar maple trees in open buckets, the open buckets can capture leaves and other debris from the rustic surroundings. 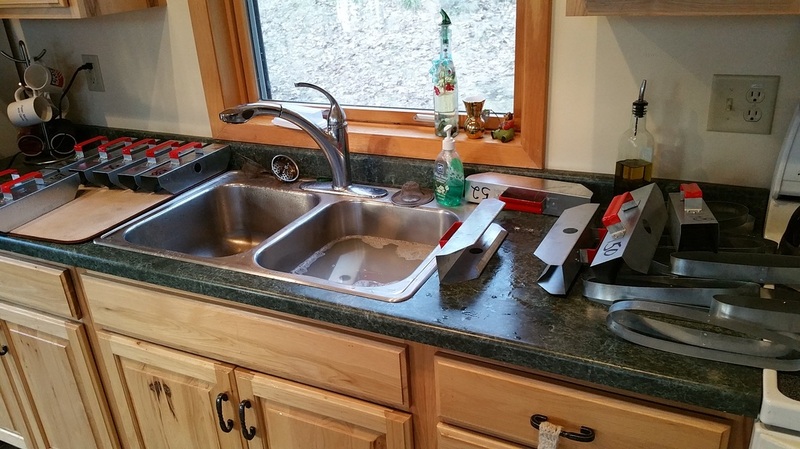 This depress is eliminated by hand when possible. 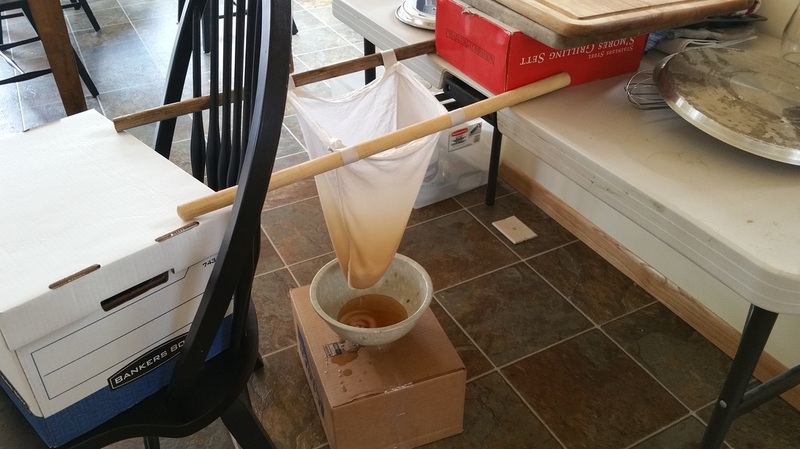 However, a preliminary filtering through a coffee filter is performed before the sap is poured into the evaporator. This final filtering through a coffee filter removes not only the smaller leaves and other small debris that have fallen into the collection bucket but also removes smaller, microscopic imperfections, contained in the sap. 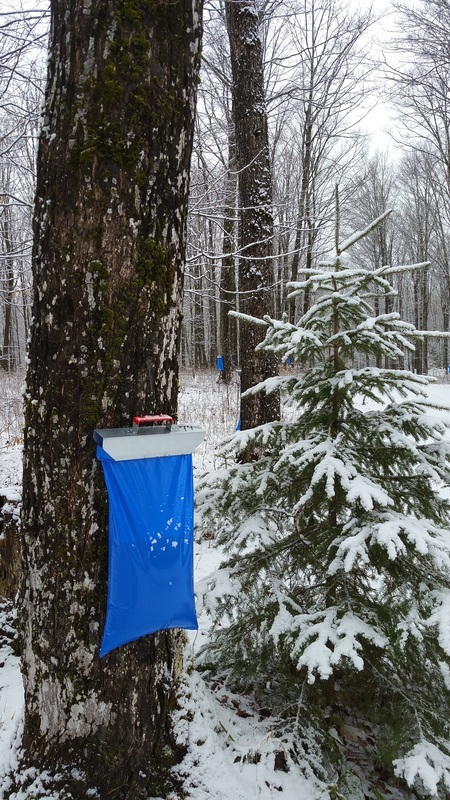 Later in the season, both moths and bees are attracted to the sugar in the sap and both are eliminated by hand. 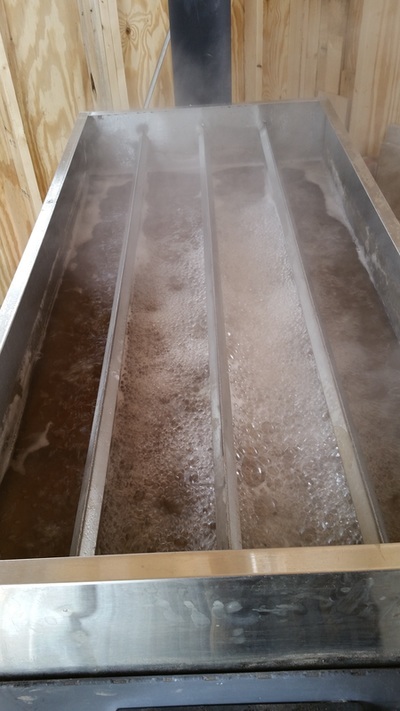 Consequently, the sap poured into the evaporator is in its purest form of maple sap, and the filtering that occurs after boiling is to simply remove the sugar sand or niter. 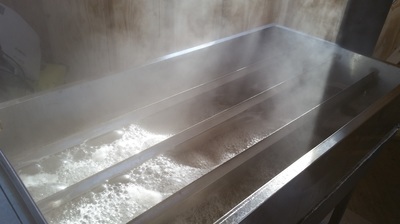 Subsequently, the “near” maple syrup is filtered to eliminate the niter as is the final maple syrup filtered to eliminate the niter that is created during the final boil to get pure maple syrup. 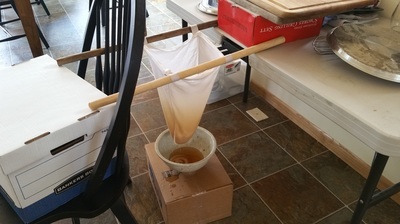 Overall, the hobbyist filters the sap four times: (1) eliminate debris that falls into the buckets during collection as well as the moths and bees that seek the sugar in the sap later in the season, (2) eliminate the microscopic imperfections by filtering through a coffee filer, (3) eliminate the sugar sand, niter, from the boil when obtaining “near” maple syrup by filtering through a cloth filer, and (4) filter the pure maple syrup through a cloth filter to remove any remaining niter. 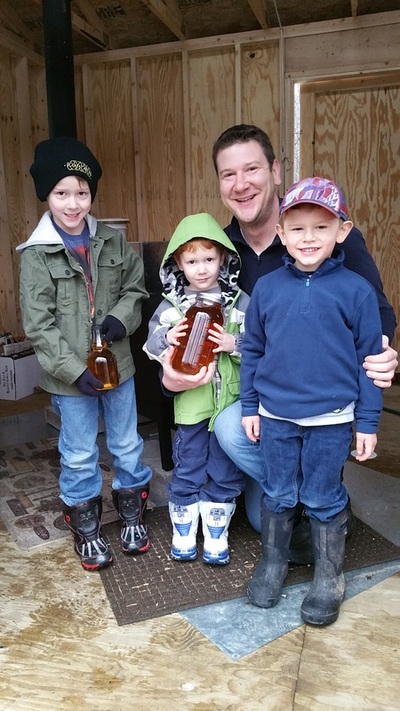 First Quart of Maple Syrup – I had the great privilege of making the first quart of maple syrup with Matt Golas and his two sons Theo and Graham. 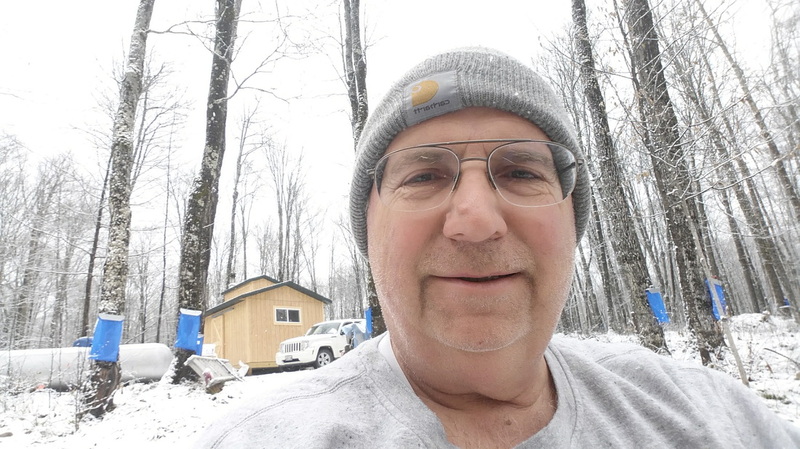 Matt is the son of a life-long friend Joe Golas who grew up in Iron River, Michigan. 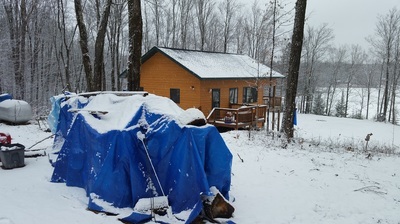 He loved the U.P. 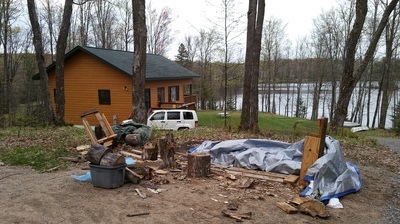 Joe and I first met at Camp Plagans in Land O’Lake, Wisconsin, a Catholic summer camp run by the Marquette Diocese. 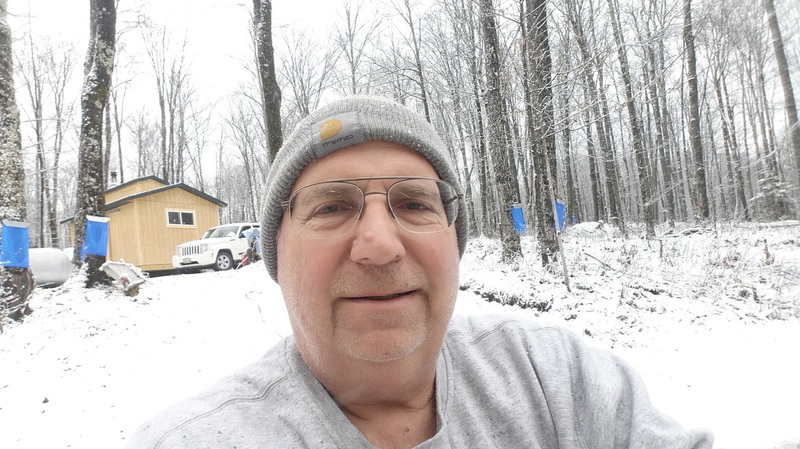 During the summers of 1968 and 1969, I worked as the Waterfront Director and Joe was the Head of Maintenance. 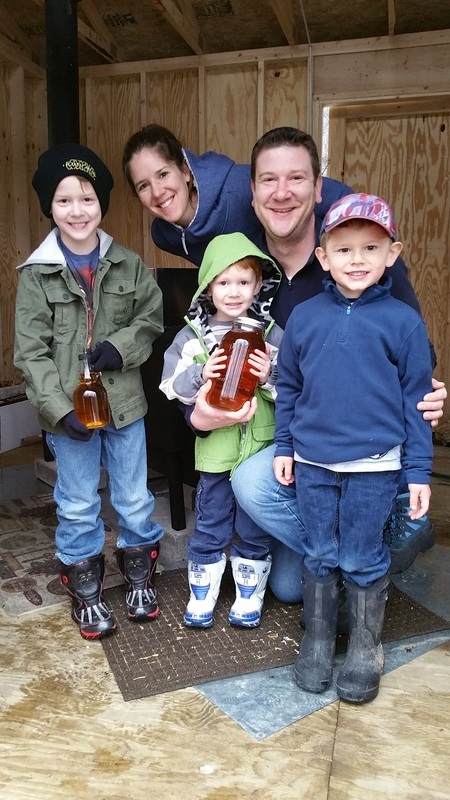 Our experience began a life-long friendship that included his Navy service, marriage to his only wife, Mary, and both the birth and raising of his two children, Katie and Matt, along with the birth and raising of our two children, Katie and Julie. All of us remain friends today, over 50 years later. Unfortunately, Joe died several months before this photograph was taken. His presence in this photograph is missed, but his friendship over the years is treasured. 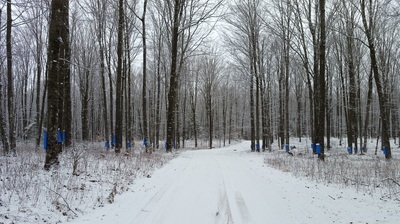 Cleaning up after the season – Bottling the maple syrup is only the second-to-last stage in making maple syrup. 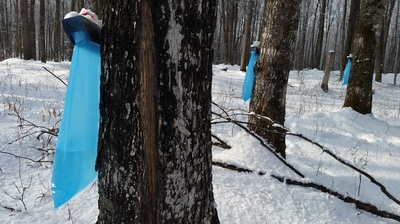 The final stage of making maple syrup is to get ready for the next maple syrup season. 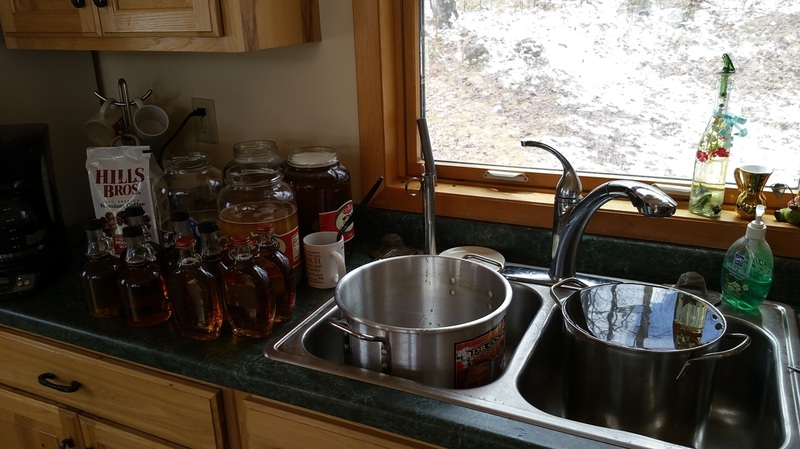 Getting ready for the next maple syrup season includes the critical step of sterilizing all equipment used during the present season. All the buckets used to collect the sap, all the metal bag hangers, and all the cooking equipment must be sterilized and properly stored. In order to accomplish this task, a mild bleach solution is used to sterilize everything including the sugar shack. 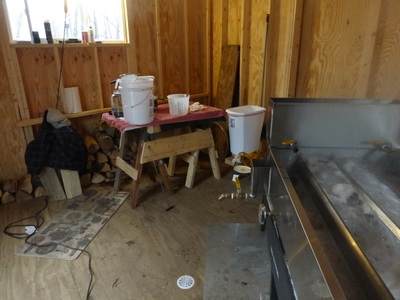 The most important part of making maple syrup, not previously mentioned, is water! 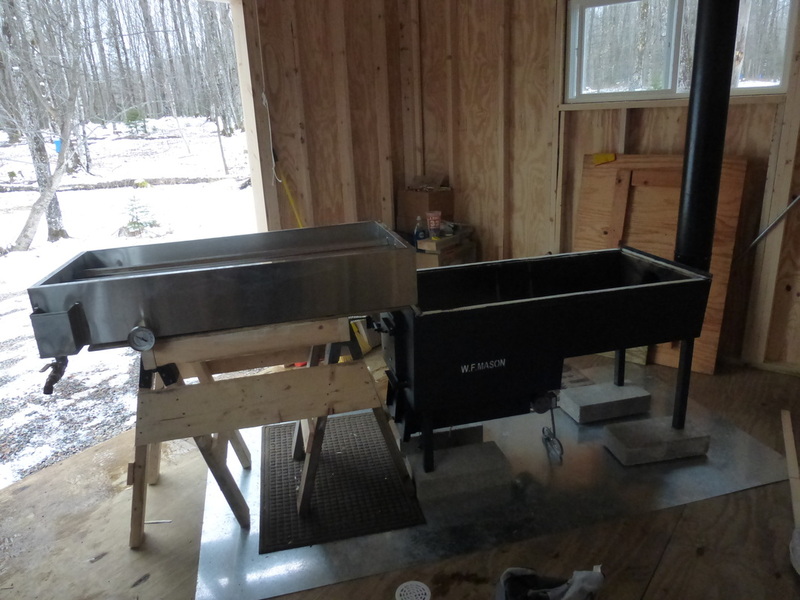 When making maple syrup, you need an ample and continuous flow of water. 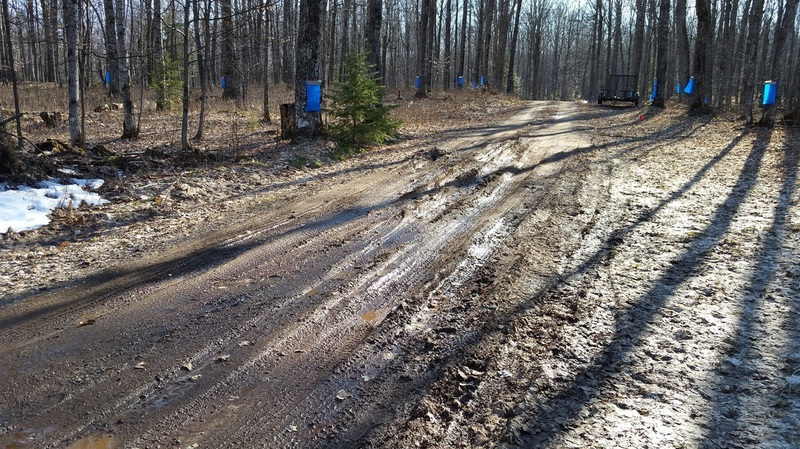 Water is certainly critical when you are cleaning up after the season, but water is also extremely important during the maple syrup season. 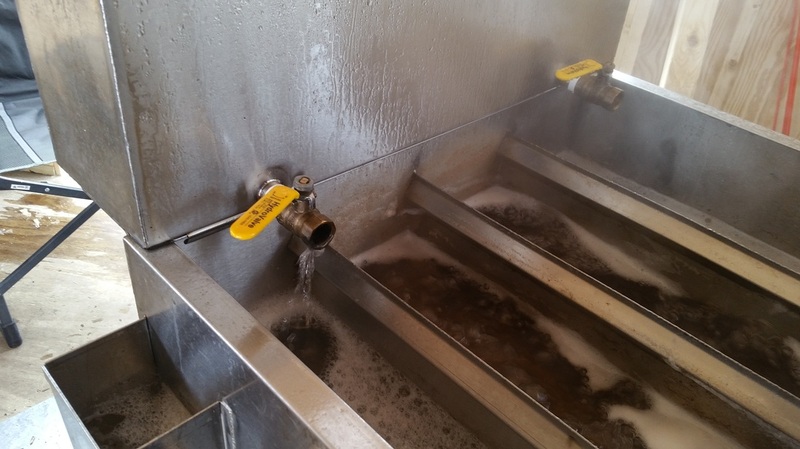 You need an ample supply and regular flow of water during the season to keep your collection buckets clean as well as to fully washout the evaporator after each boil. During the maple syrup season, it is best not to use bleach to clean your buckets and evaporator. Instead, it is best to rinse your buckets with water after each use to eliminate the sugar from forming fungus, especially during the warm days of spring. 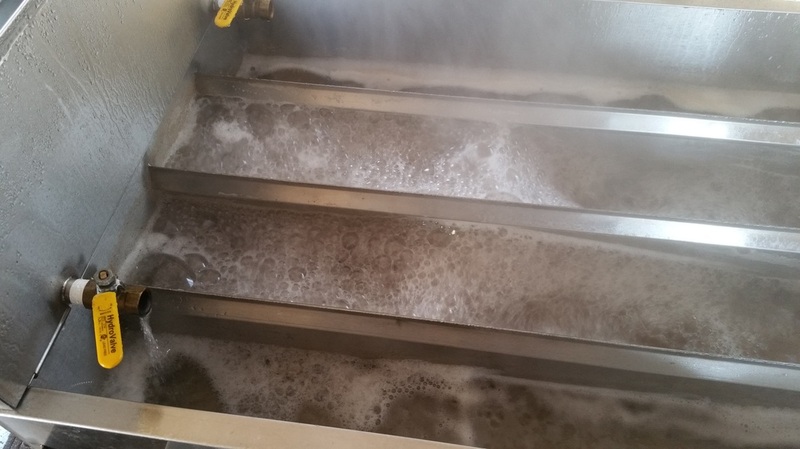 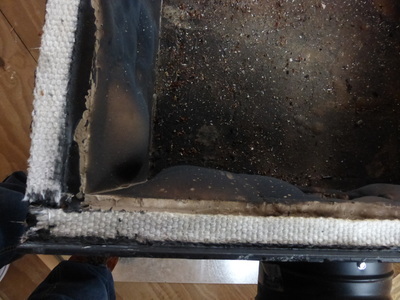 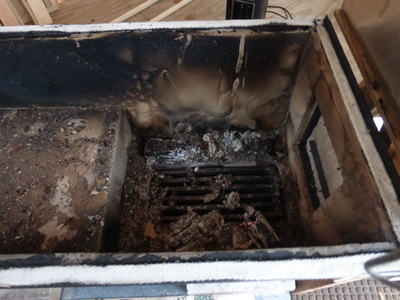 Without constant and prompt washing with water, fungus can grow in the buckets and evaporator during the season. 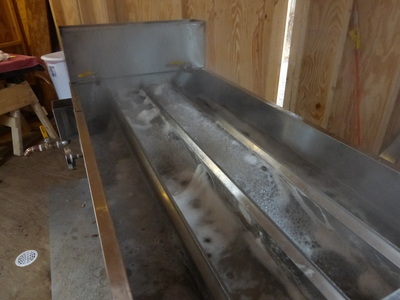 After the season, water is the essential element for sterilizing everything afterwards. 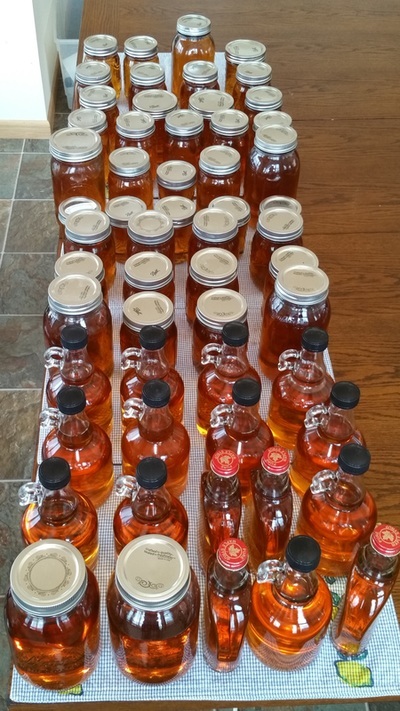 Fuel for next year – The maple syrup season never ends! 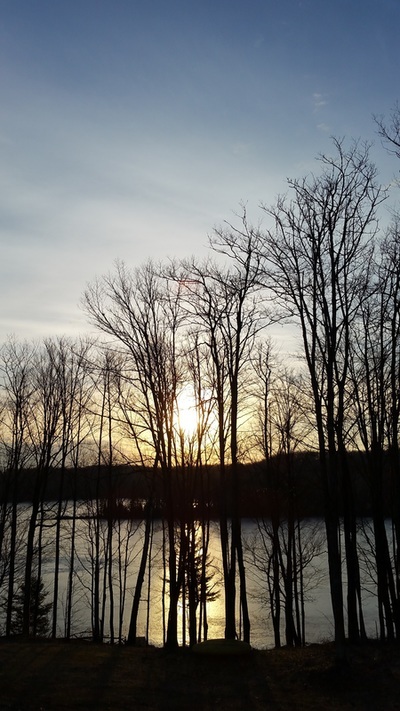 The next season is always on the horizon. 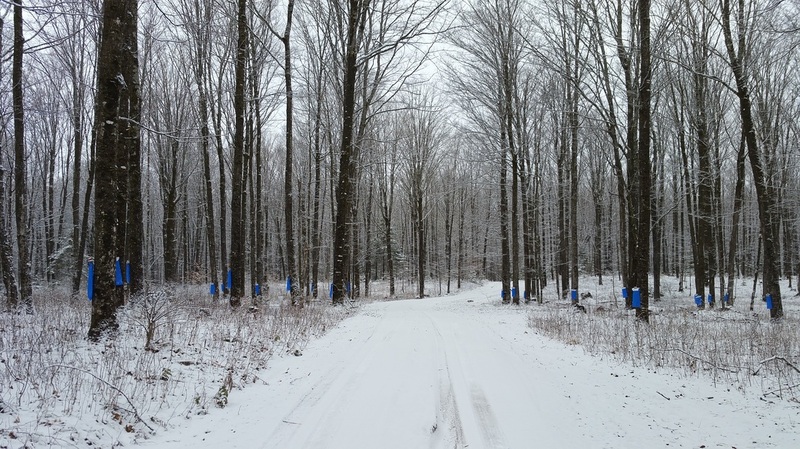 You will need fuel for the next season. 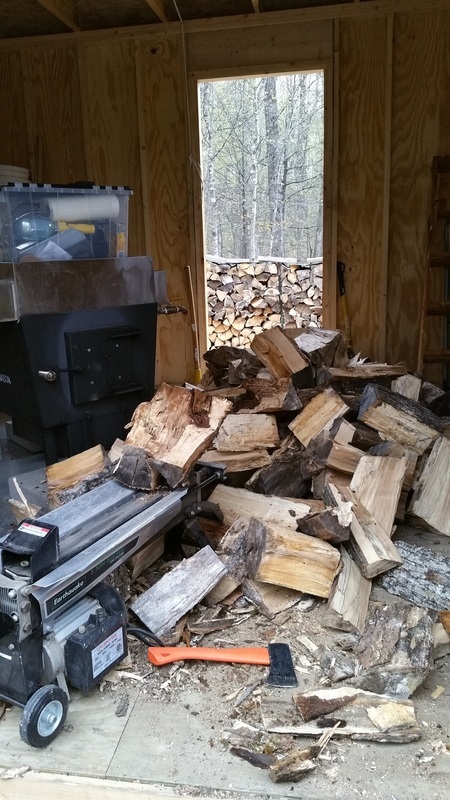 Fuel means wood. 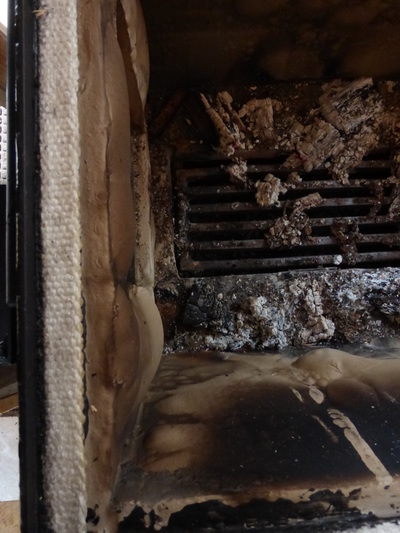 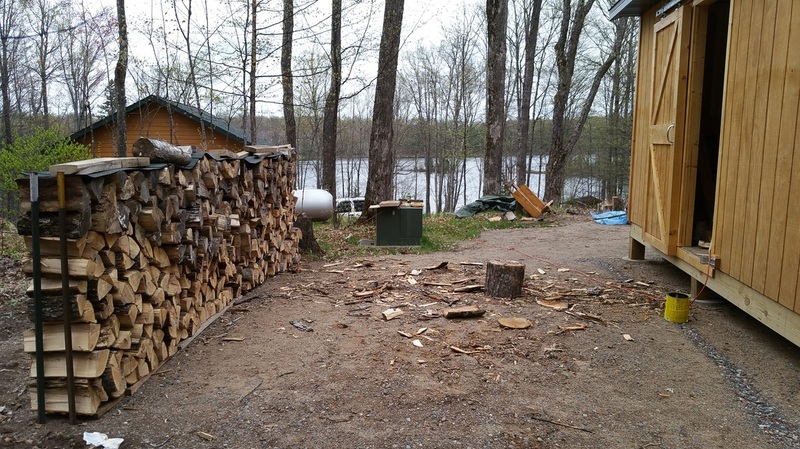 You will need several cords of wood to burn next season and that wood must be air seasoned. 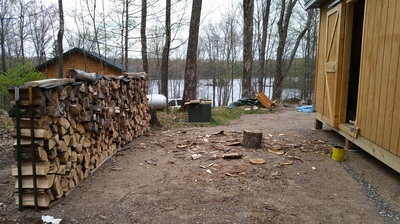 Consequently, you will always be looking for more wood to cut and split for next season. 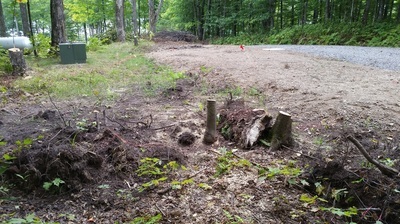 Fallen trees caused by old age or storms are great sources of fuel for the next season. These trees must be cut, then spit, then stacked for proper air seasoning. 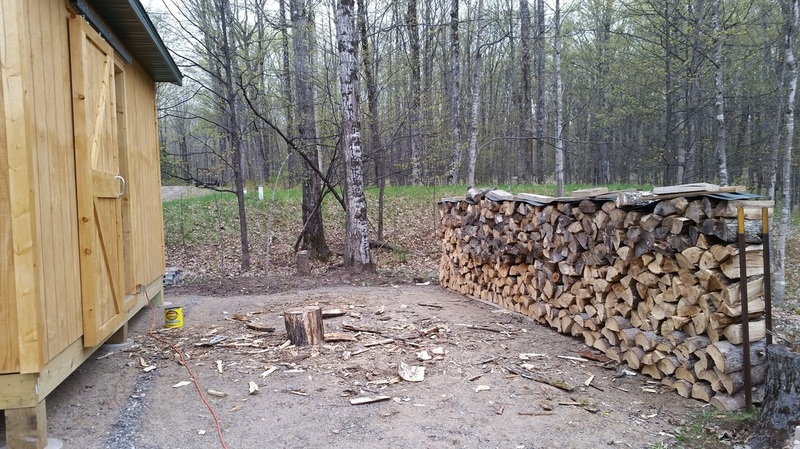 The work of a hobbyist maple syrup maker is never done as there are always more trees to harvest, split, and stack for the next maple syrup season.